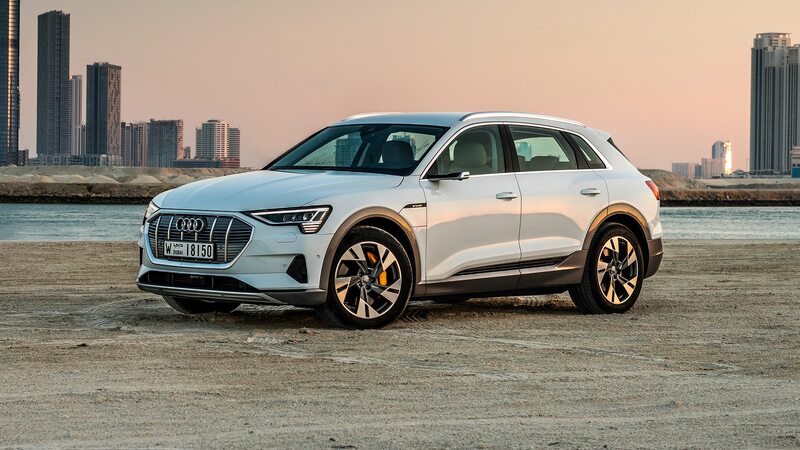 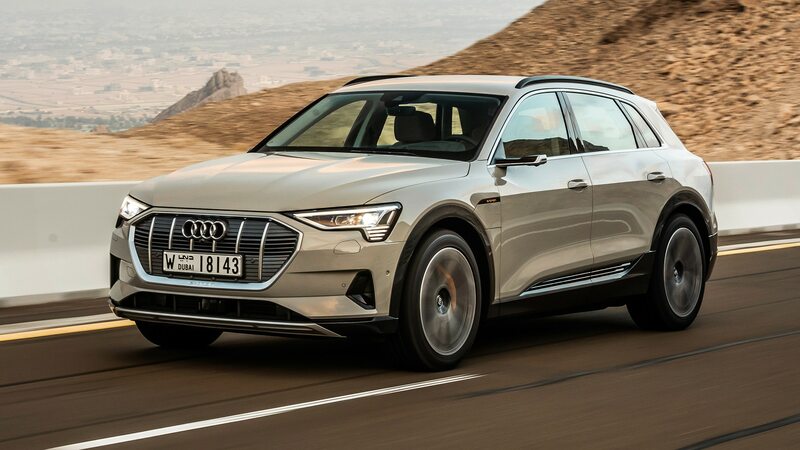 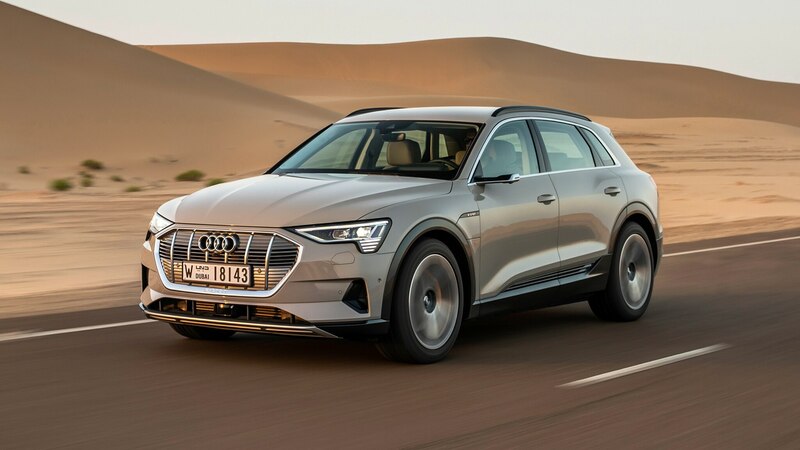 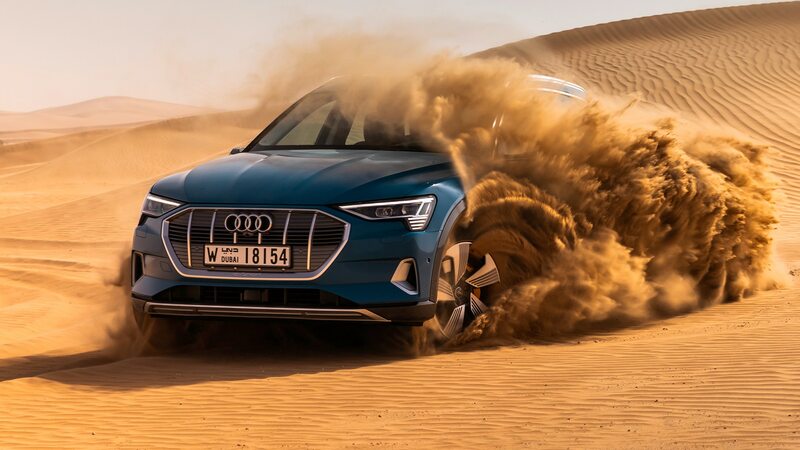 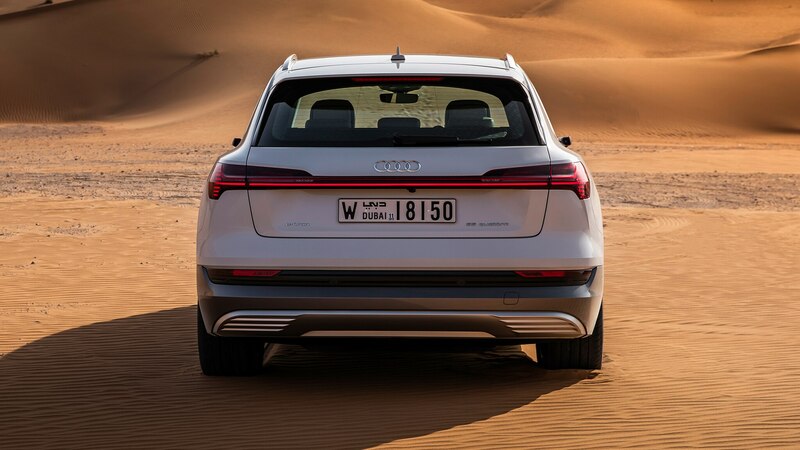 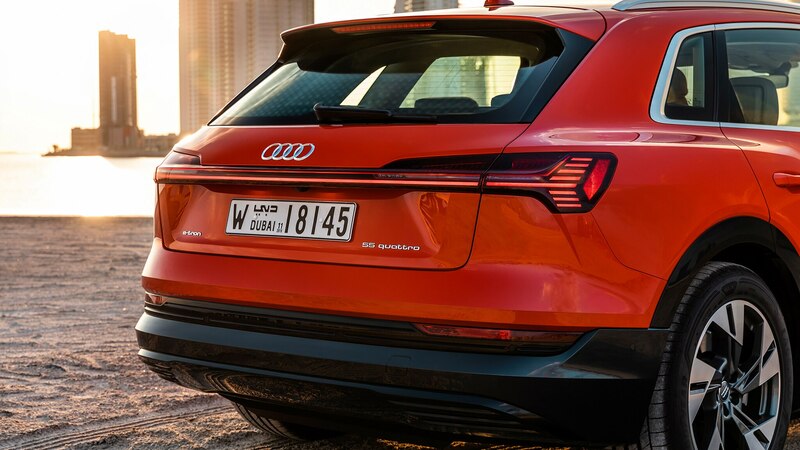 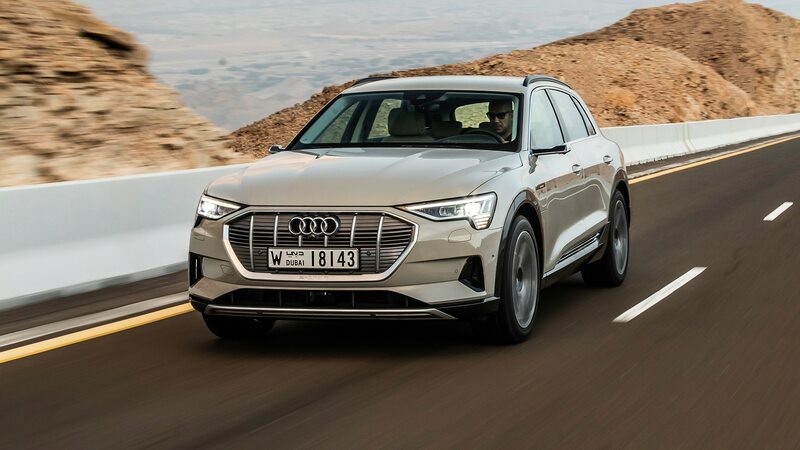 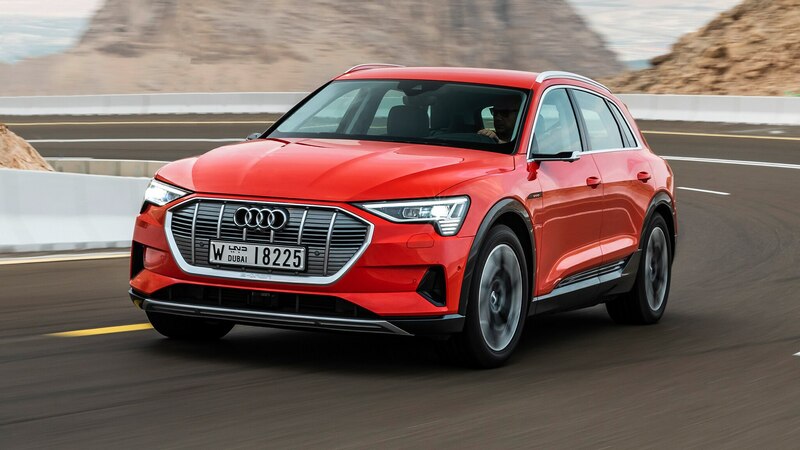 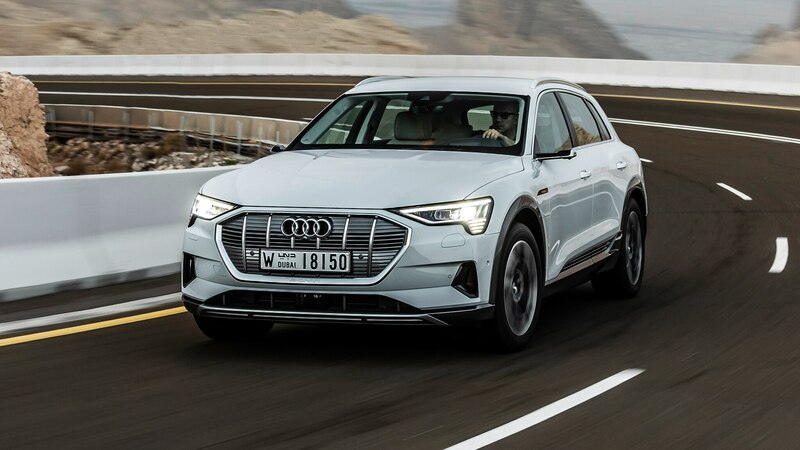 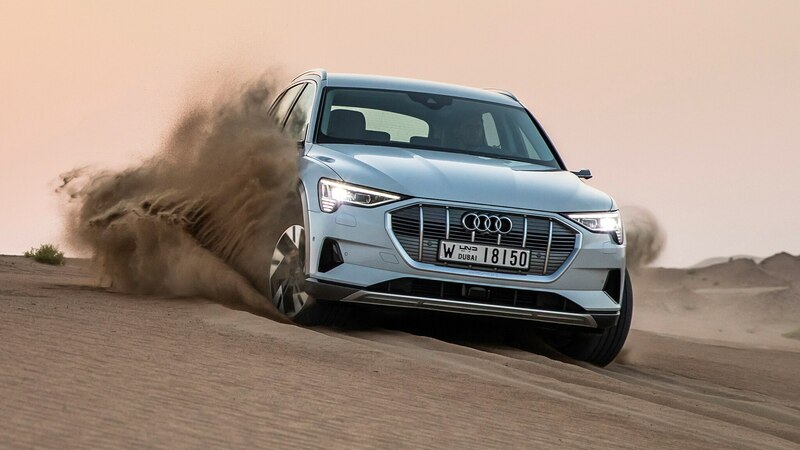 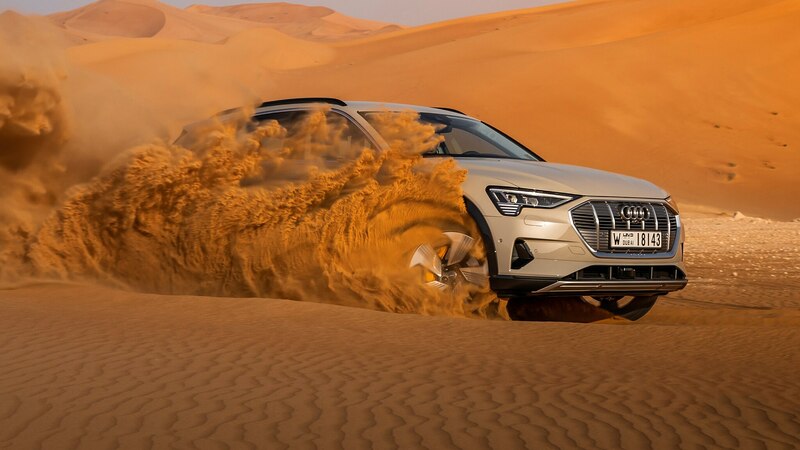 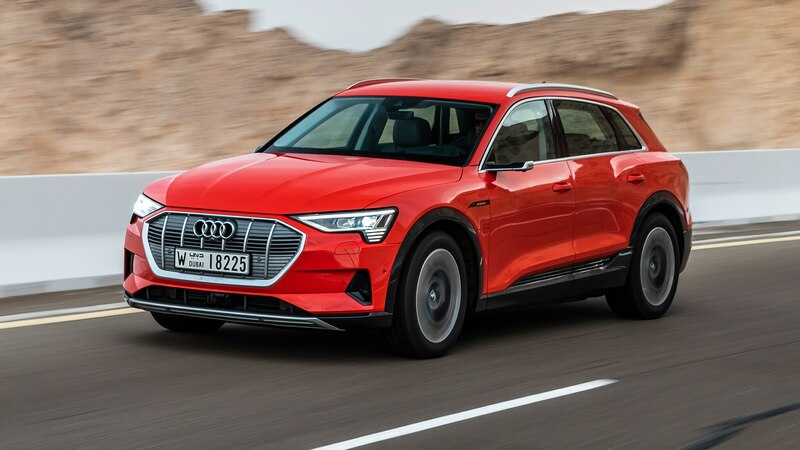 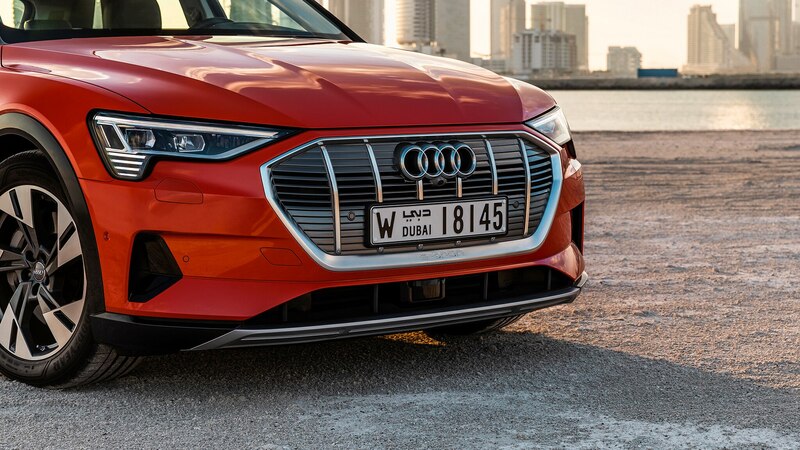 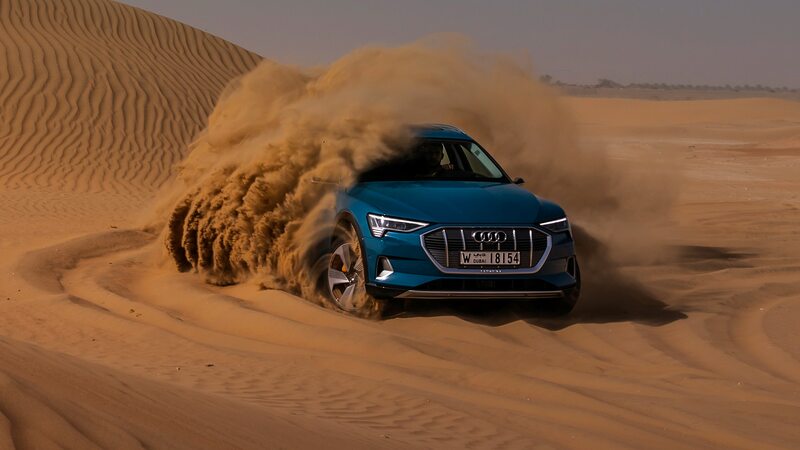 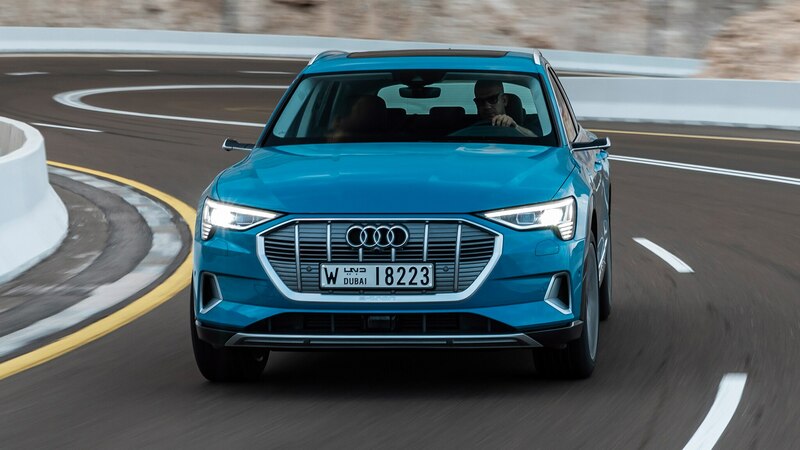 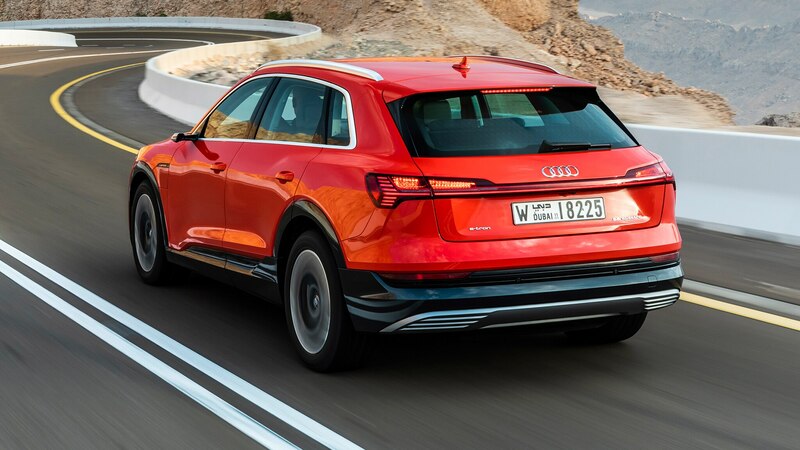 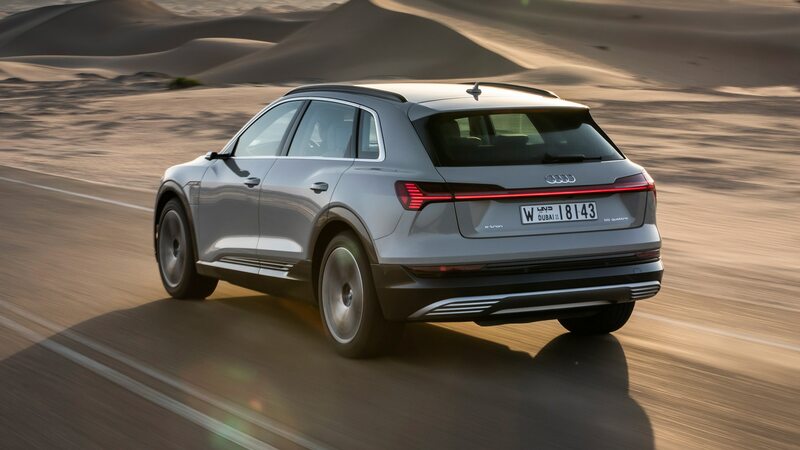 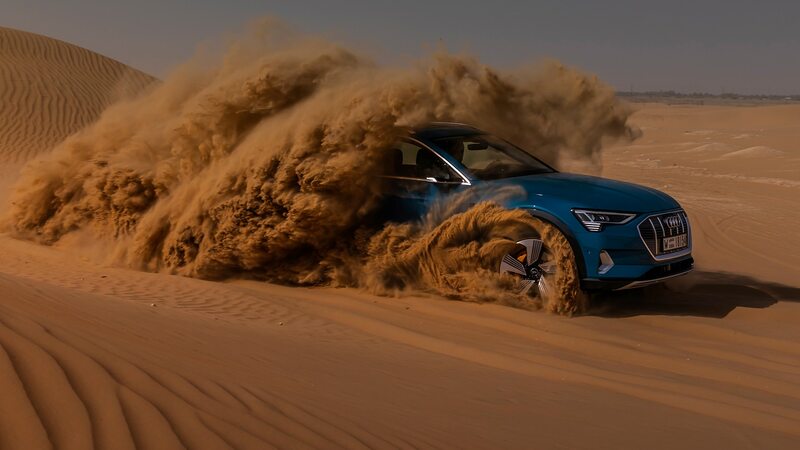 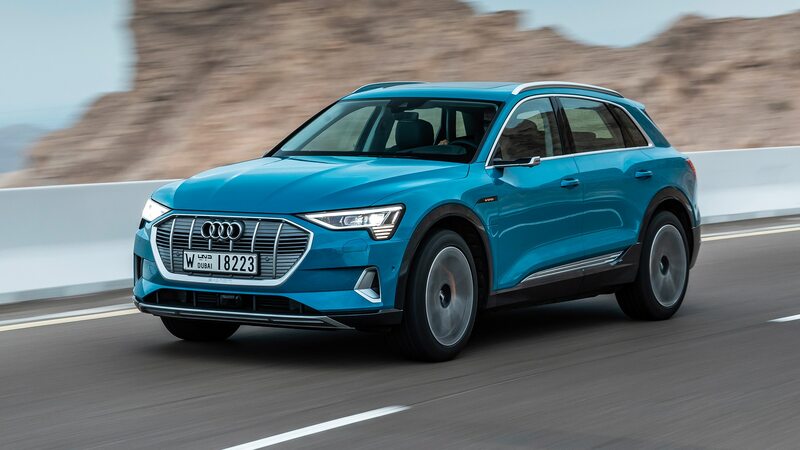 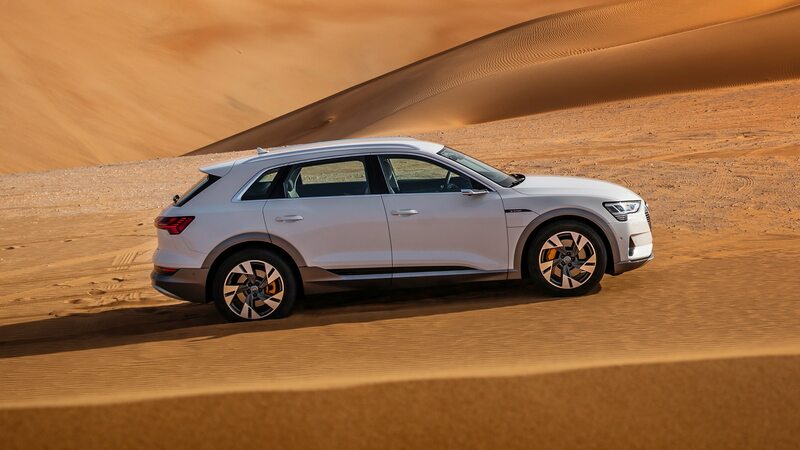 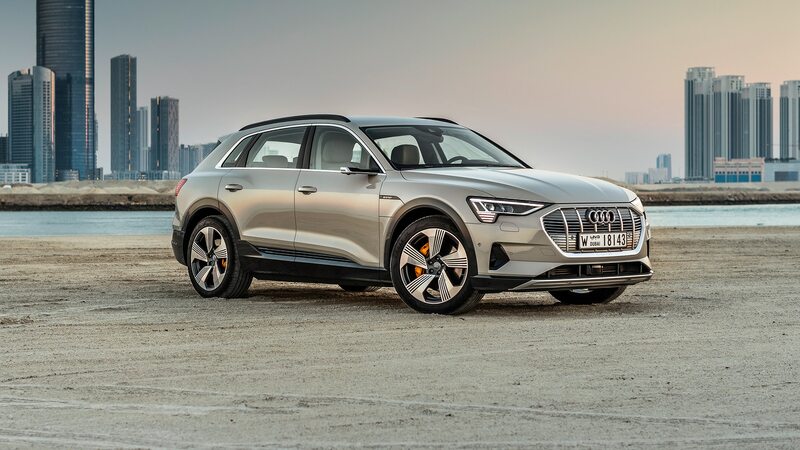 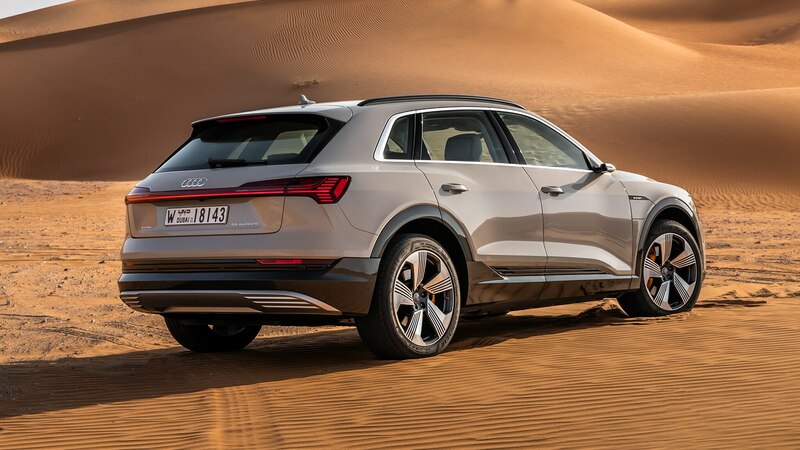 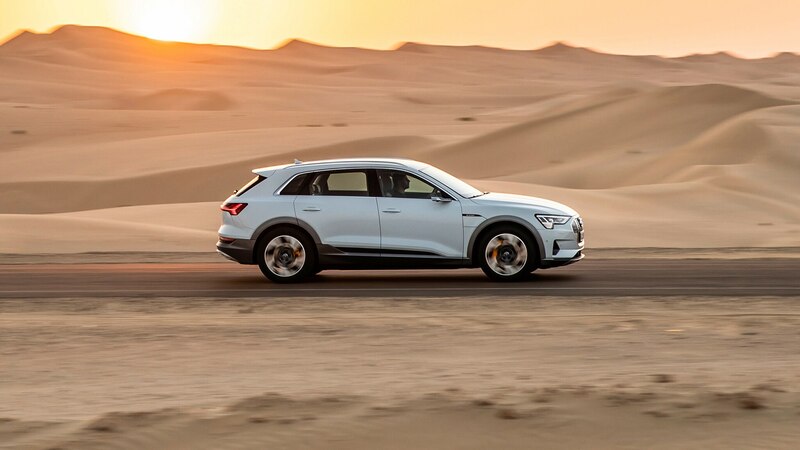 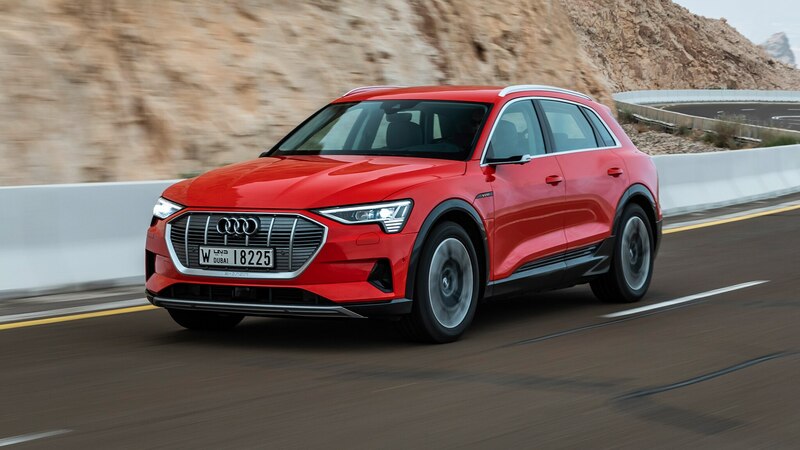 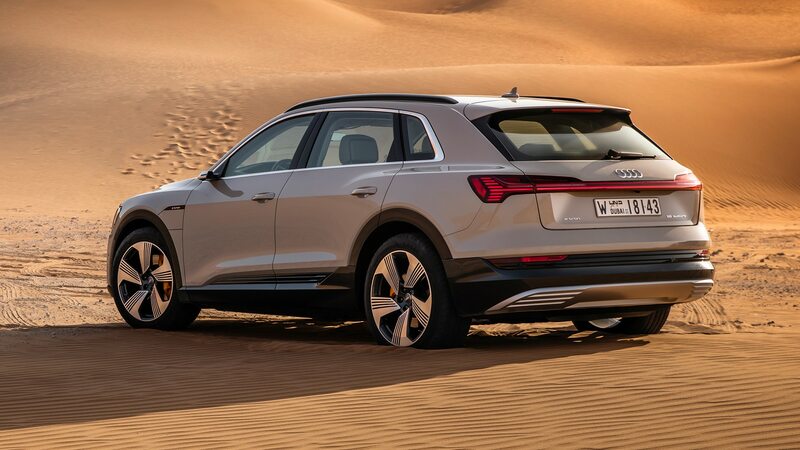 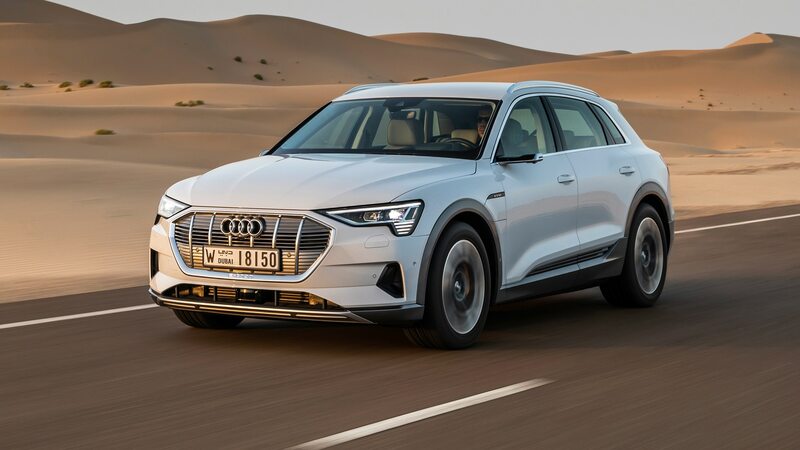 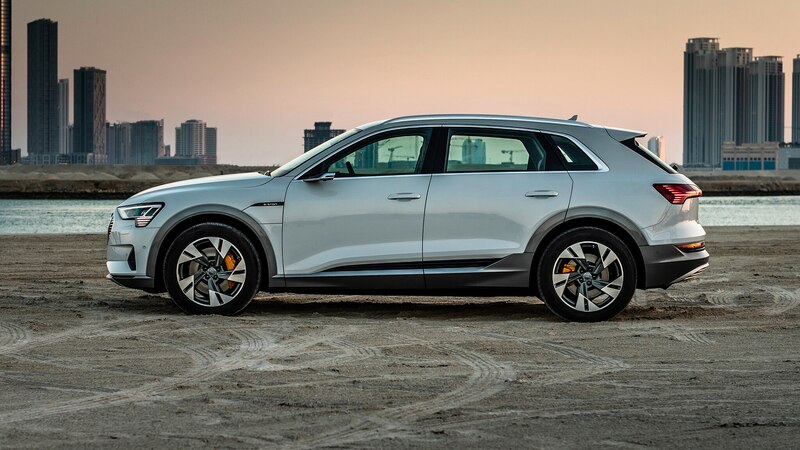 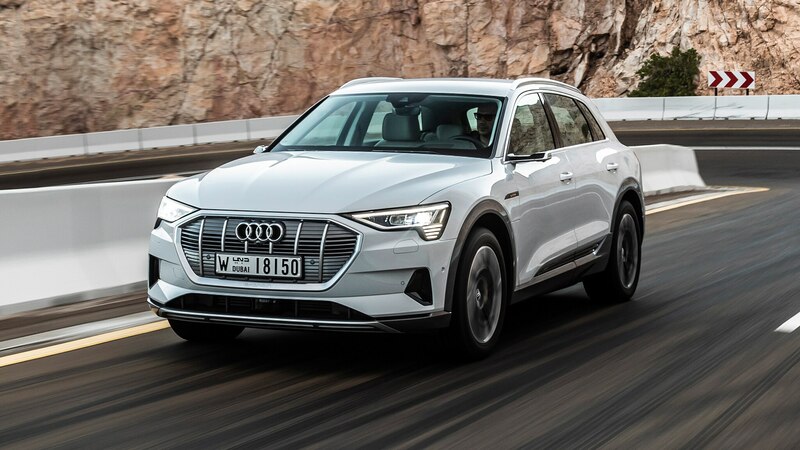 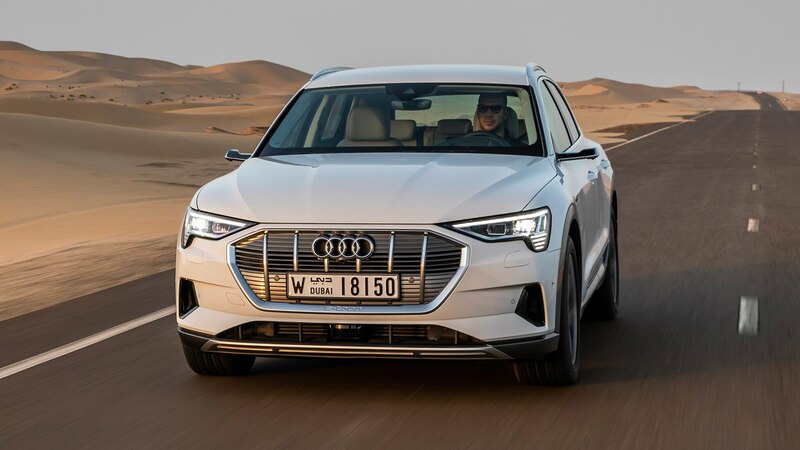 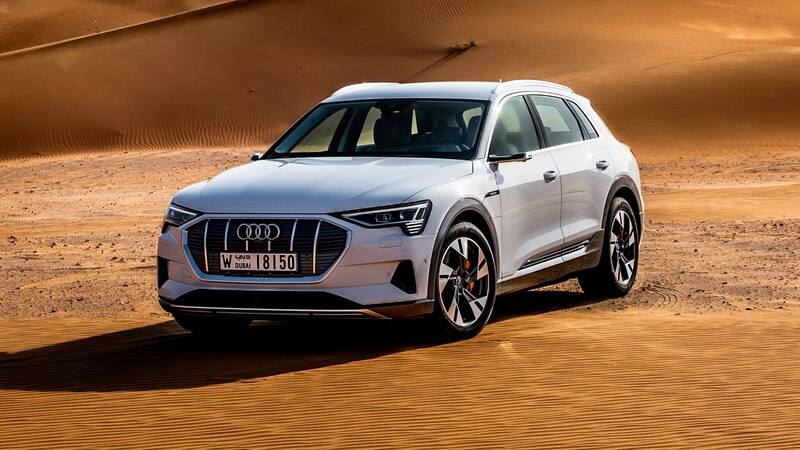 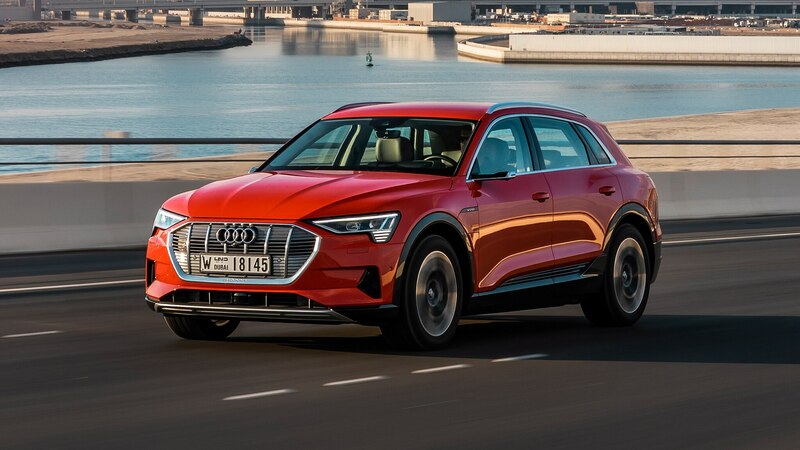 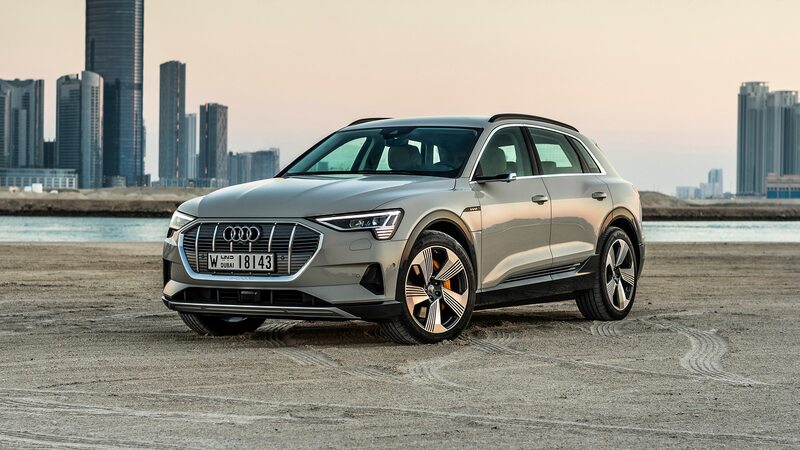 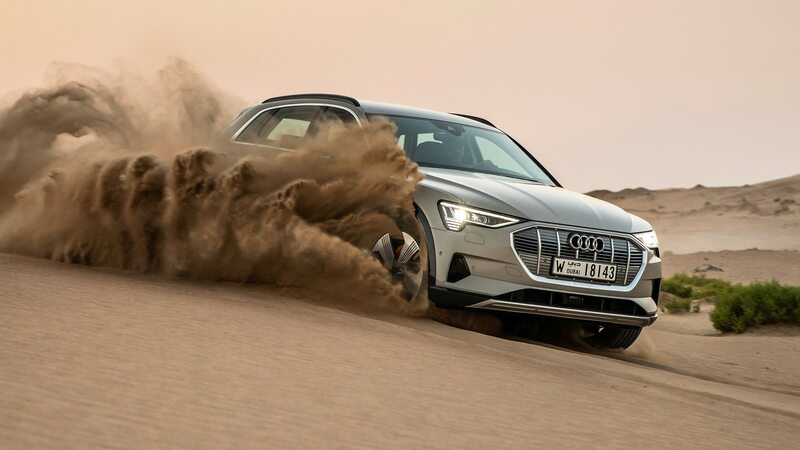 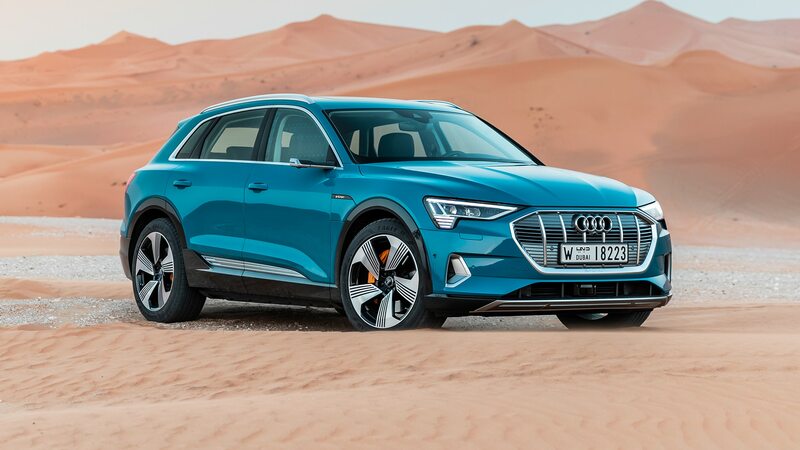 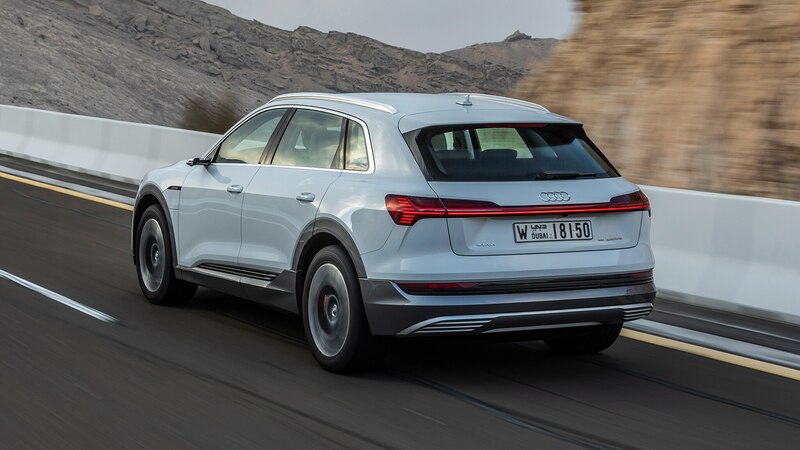 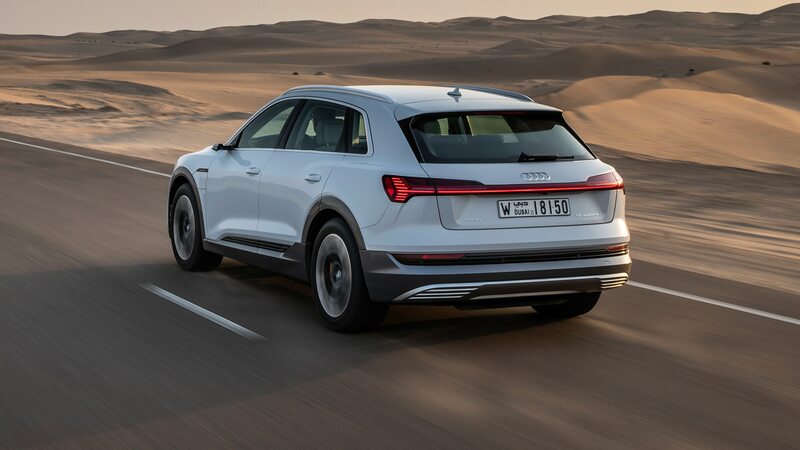 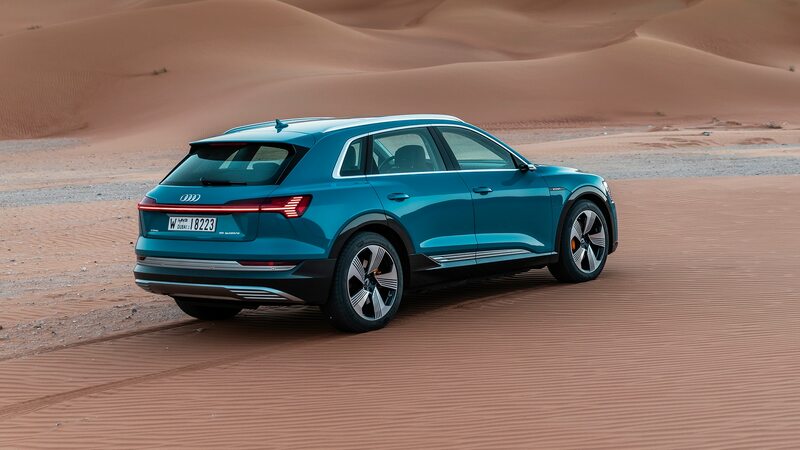 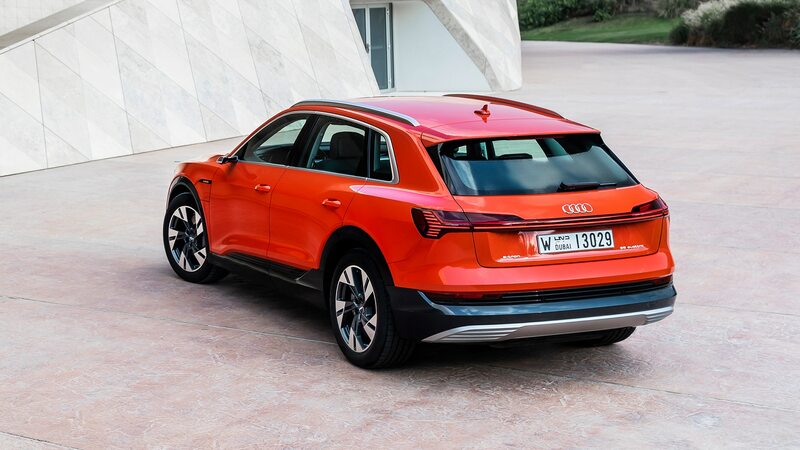 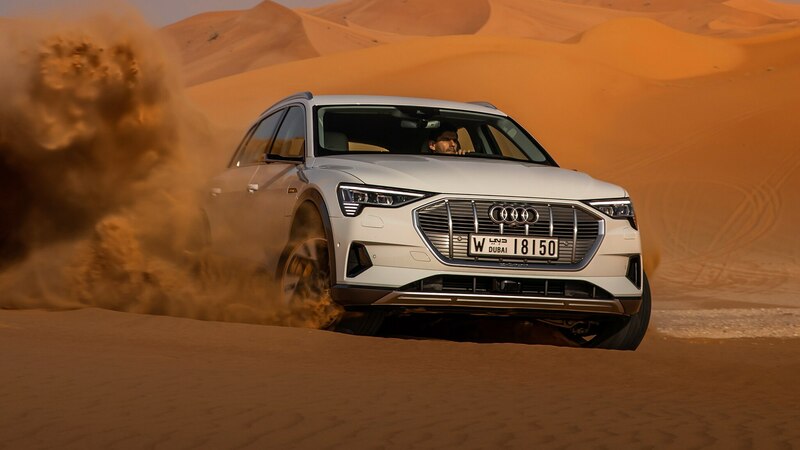 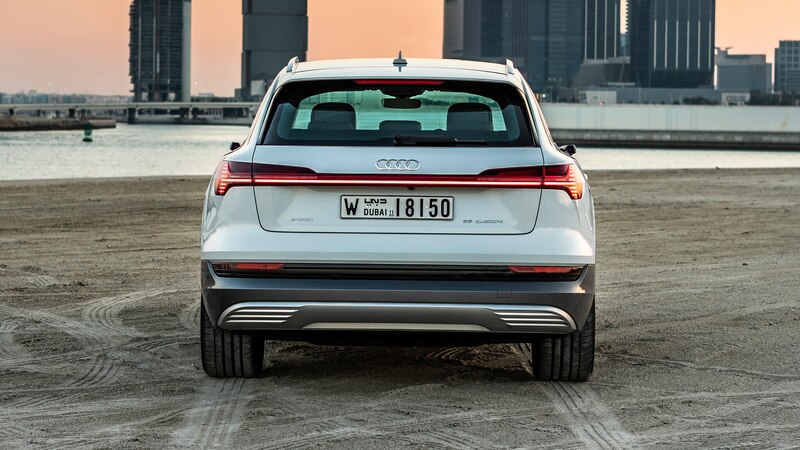 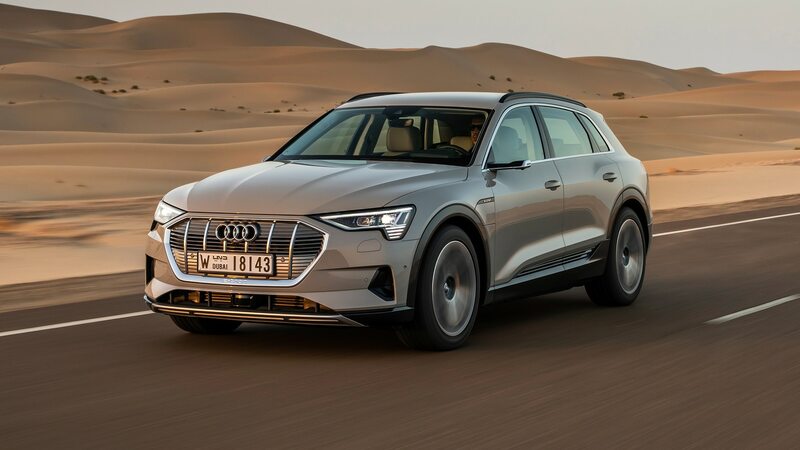 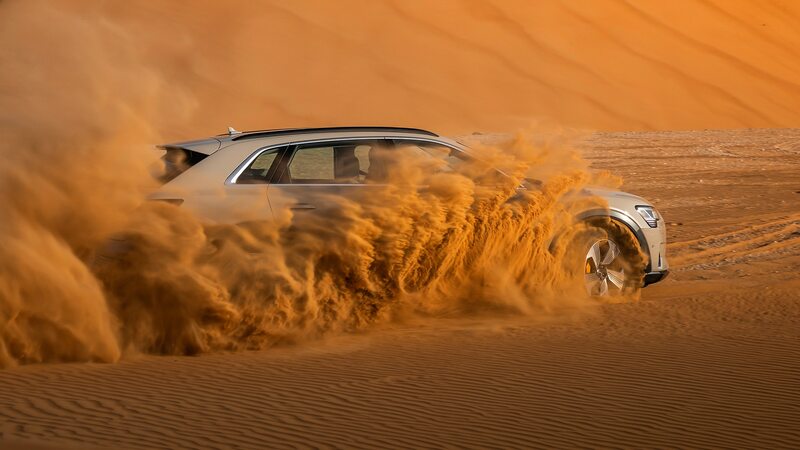 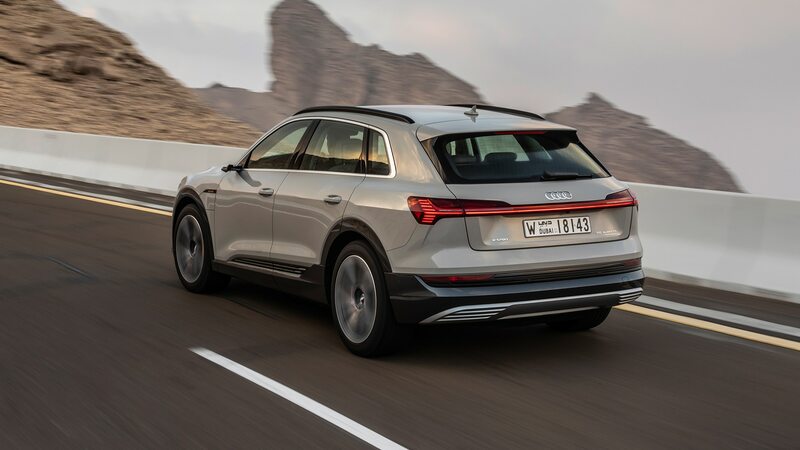 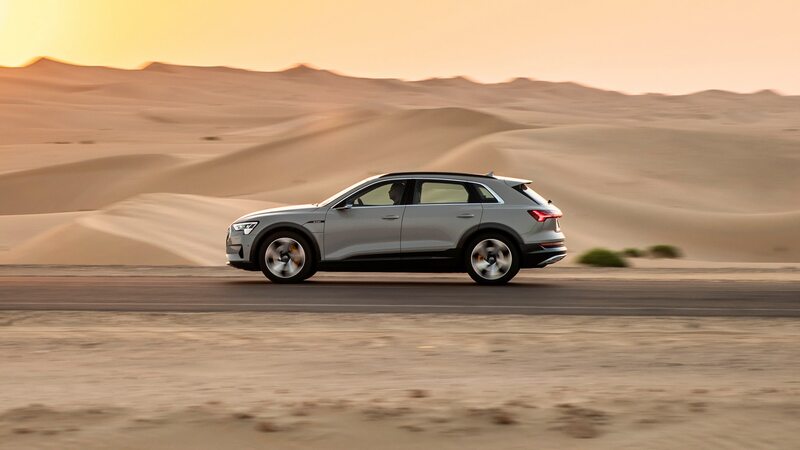 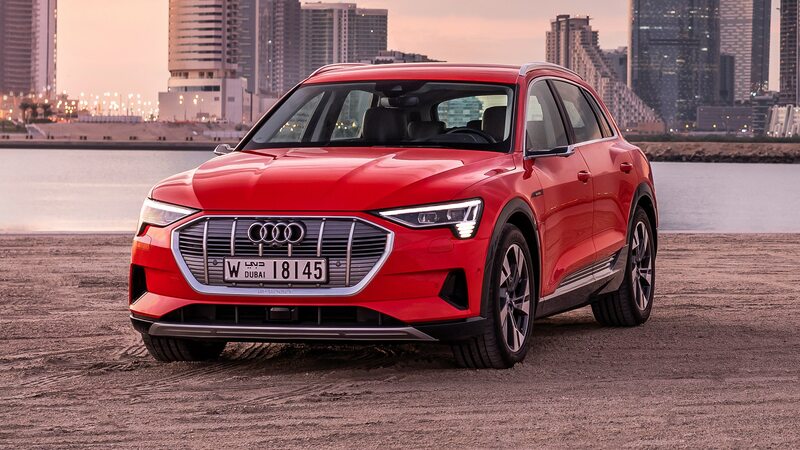 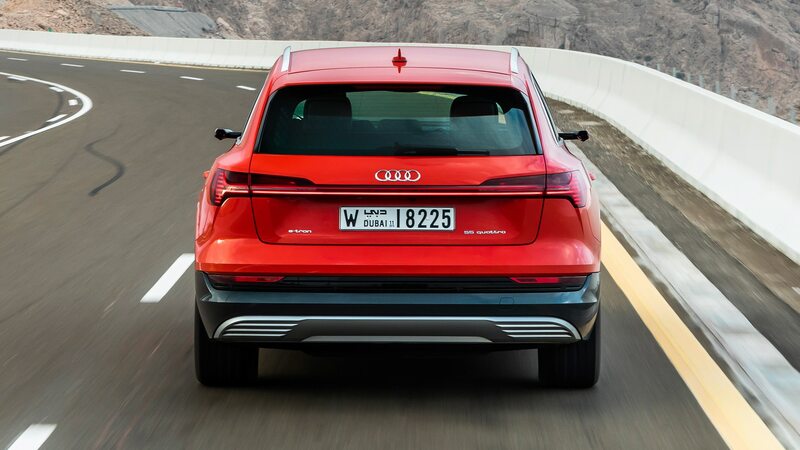 ABU DHABI, United Arab Emirates — It might seem a little unusual to travel all the way to Abu Dhabi, the most petrochemically gifted of the seven United Arab Emirates, to test out the 2019 Audi e-tron, an all-new SUV that eschews sweet crude in favor of ethereal electrons. 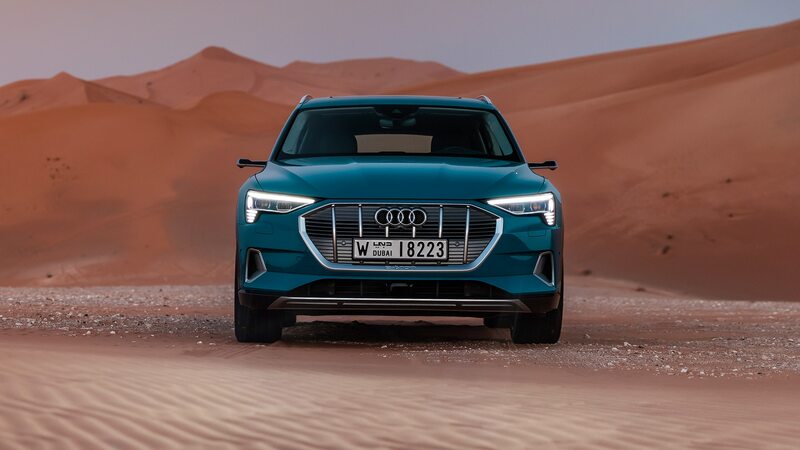 Widen the perspective past the hydrocarbon filter, however, and you’ll find a surprising number of links between the prosperous Persian Gulf state and Germany’s latest battery-powered contender. 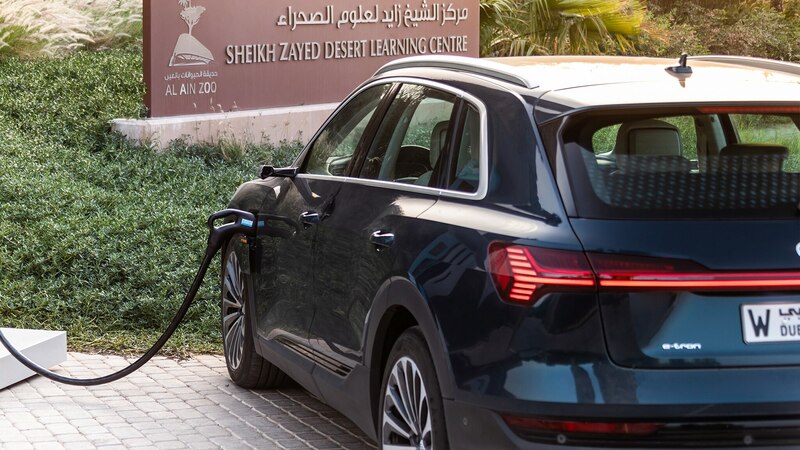 Indeed, despite sitting on top of a full nine percent of the world’s oil reserves, the UAE has diversified its economy to the point where well more than half its GDP is derived from somewhere other than a pipeline. 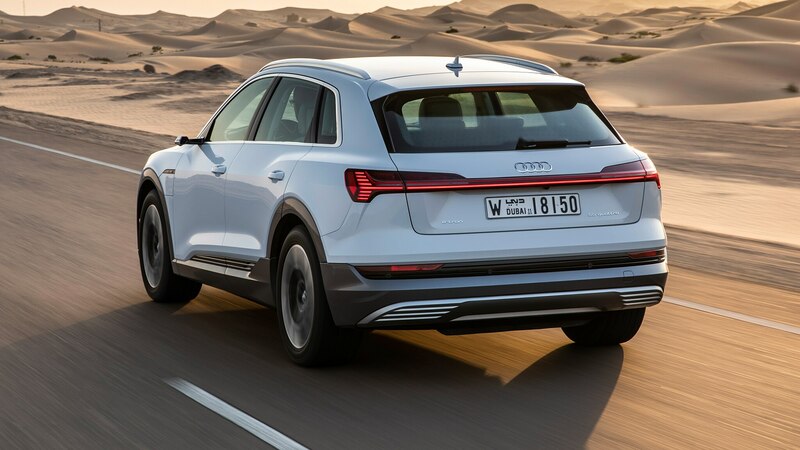 There must be life after gasoline, the leadership reasons, and this is a conclusion with which the wider VW Group agrees. 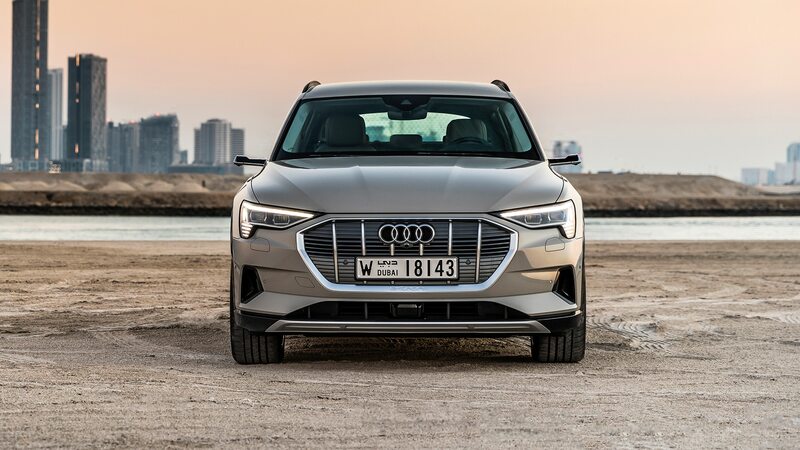 It’s fitting, then, that our e-tron drive begins in Masdar City, which stands as Abu Dhabi’s first carbon-neutral development powered entirely by renewable energy. 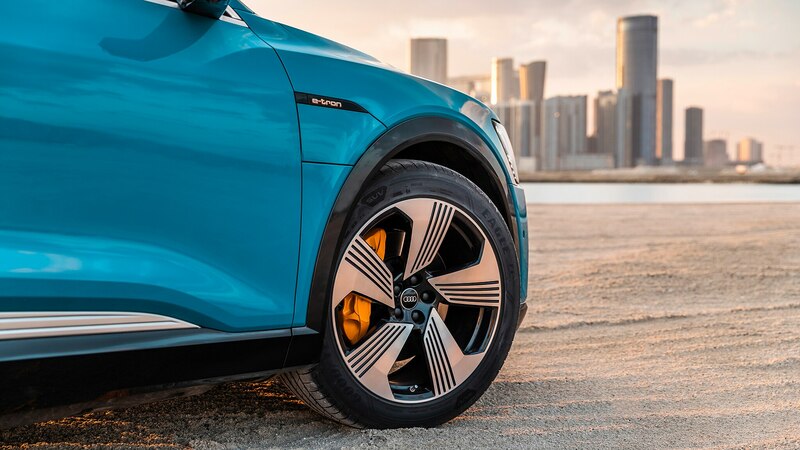 Audi’s e-tron is pursuing the same eco-minded, luxury-SUV buyers as the Tesla Model X and the Jaguar I-Pace, and front and center in this effort is the brand’s MLB-evo modular platform. 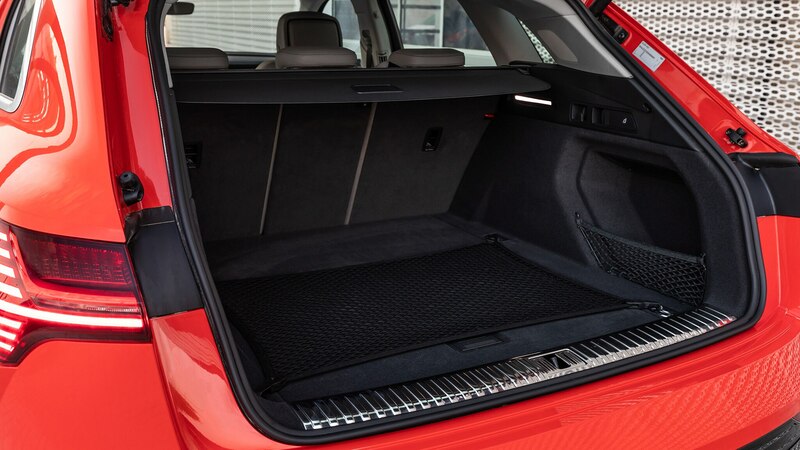 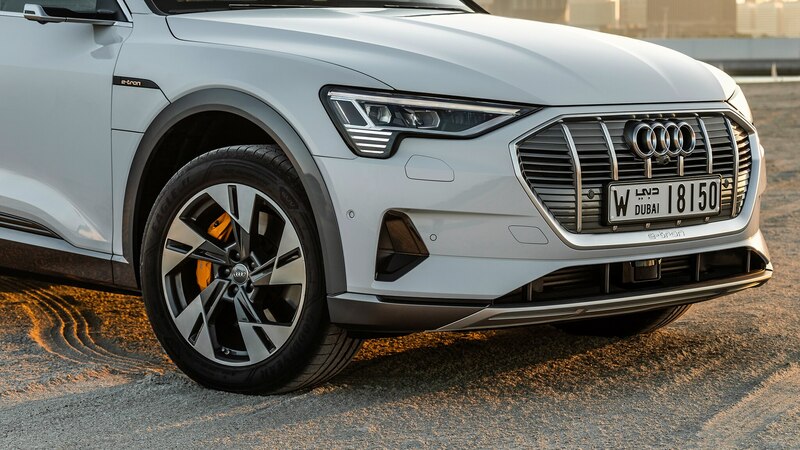 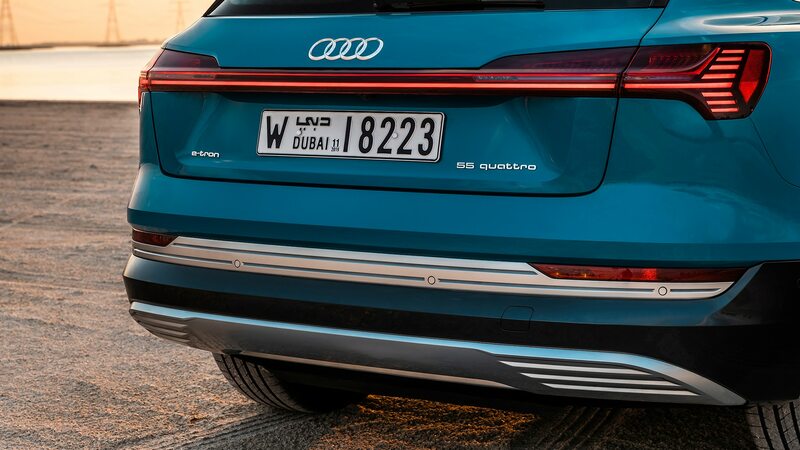 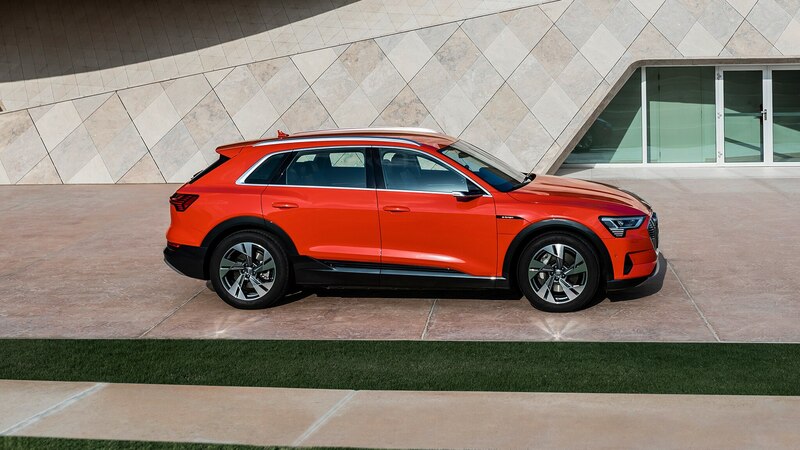 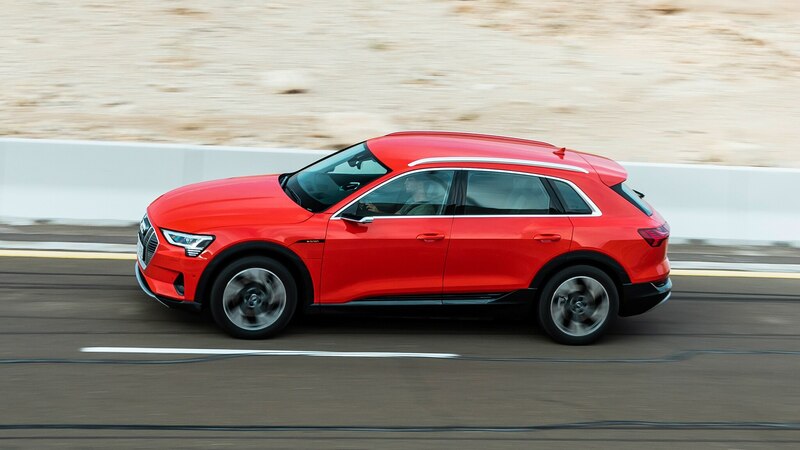 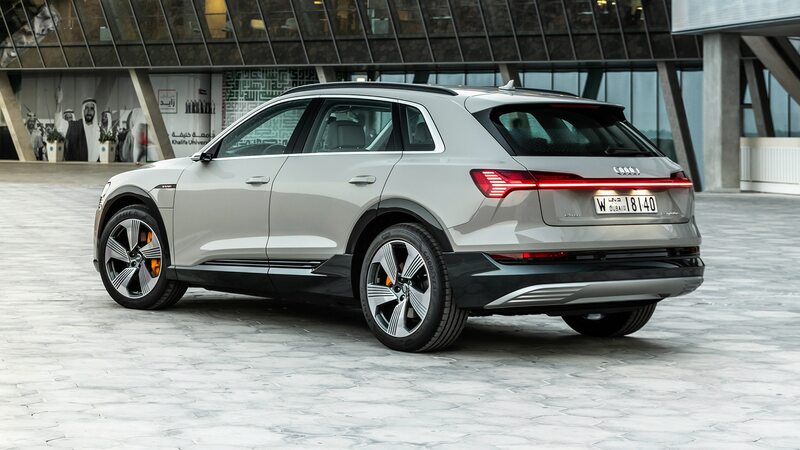 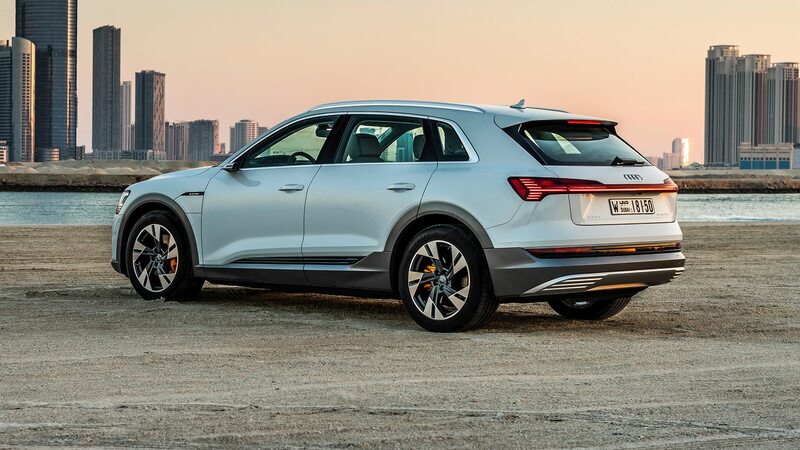 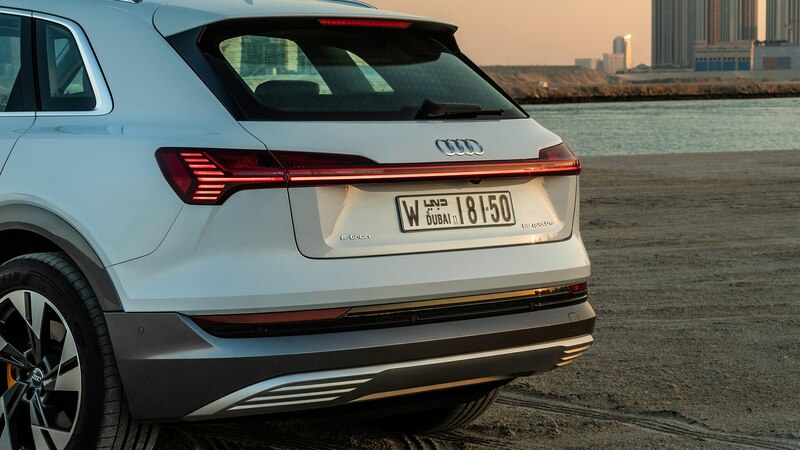 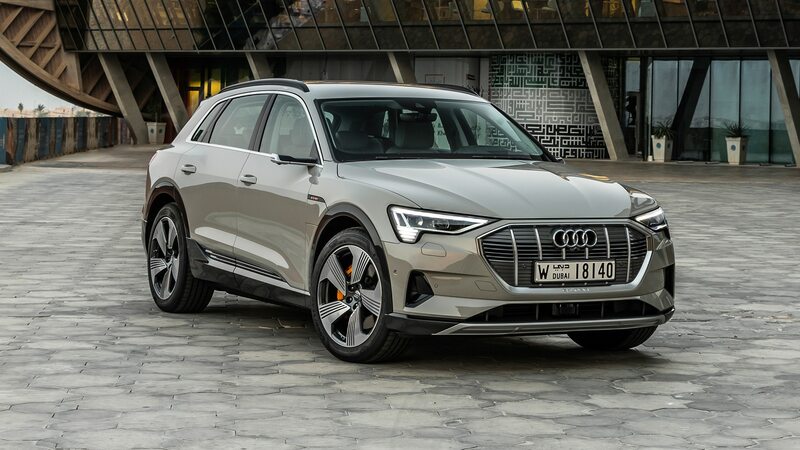 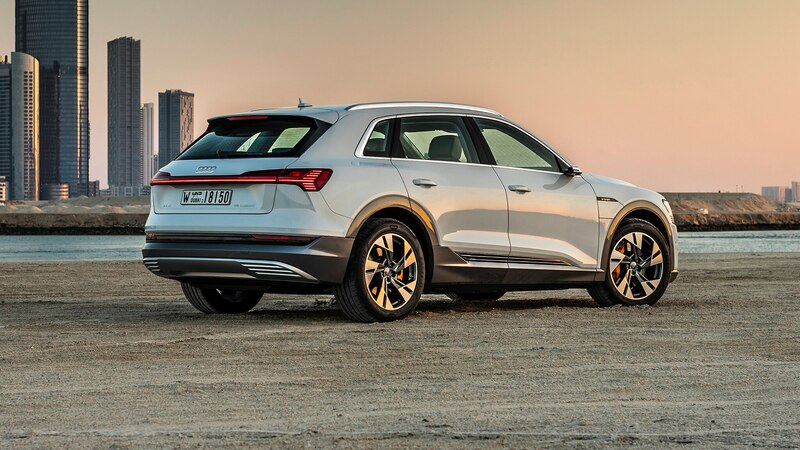 With a wheelbase of just over 115 inches, the e-tron slots in just below the full-size Q8 while offering a comfortable upgrade over the slightly smaller Q5. 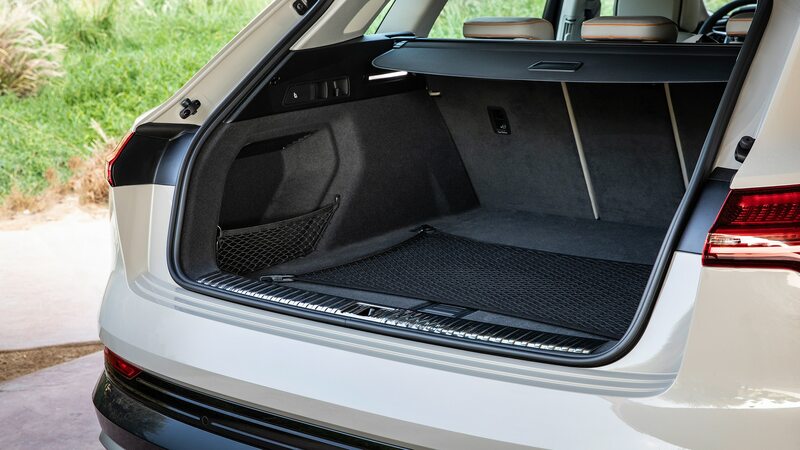 It also splits the difference between the two in terms of cargo space, offering 57 cubic feet of max stowage. 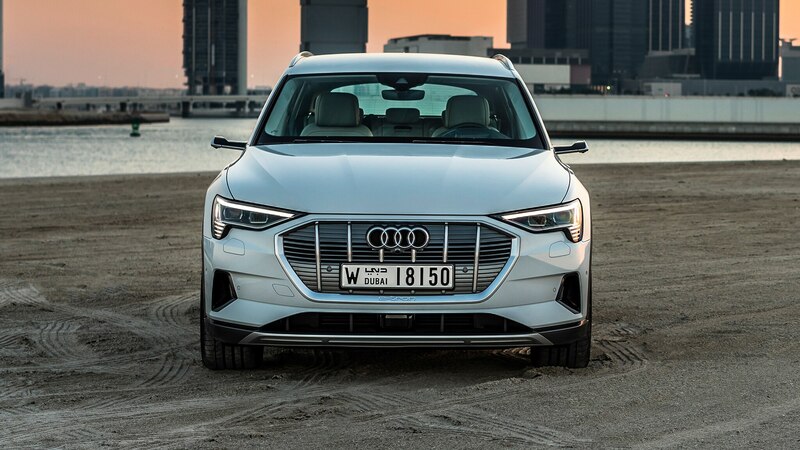 The be-frunked, all-wheel-drive e-tron is powered by a pair of current-excited electric motors; a 125-kW unit acts on the front axle and a 140-kW one on the rear. 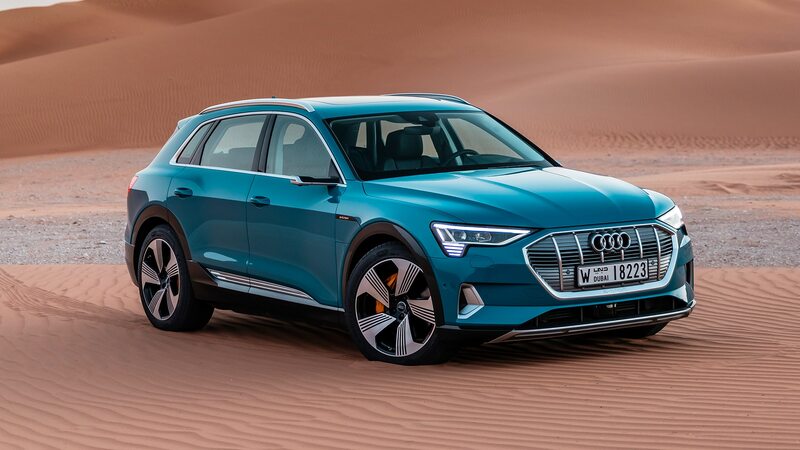 Two-stage planetary single-speed gearboxes transfer the power, and the magnet-free motors eliminate not just electrical drag, but also the need for more exotic minerals found in other electric-motor designs. 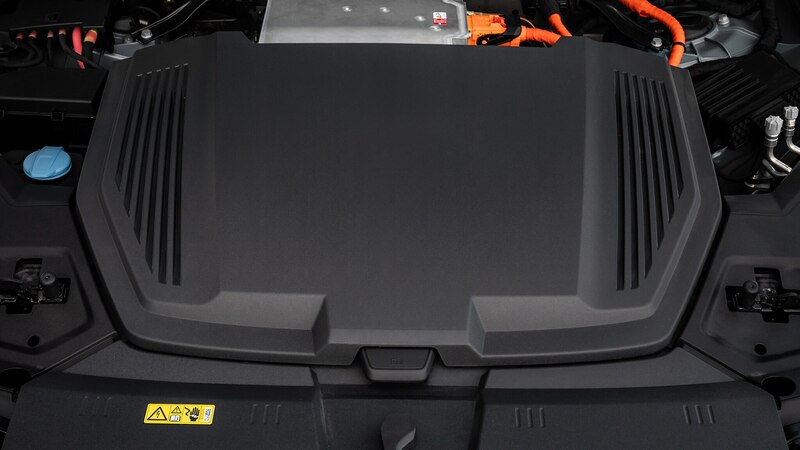 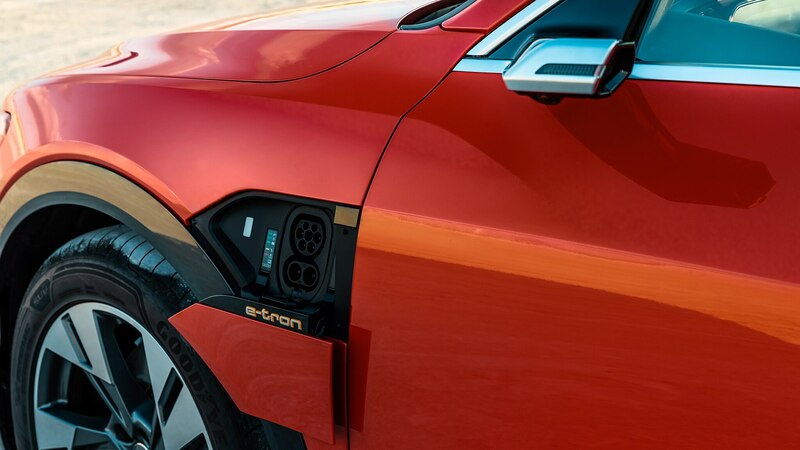 Drawing energy from a 95-kWh battery pack—itself an evolution of thermal management that promises no performance penalty in extreme heat—the drivetrain promises total output in the neighborhood of 355 horsepower and 414 lb-ft of torque. 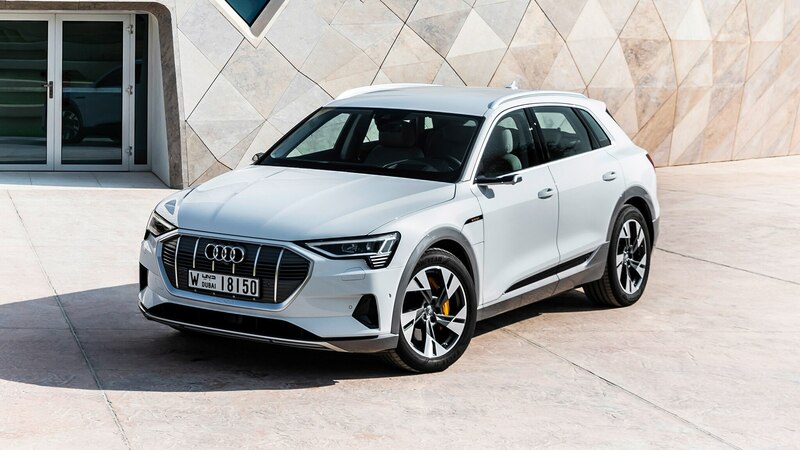 It’s possible to tap into as many as 400 horses and nearly 490 lb-ft by way of the e-tron’s “overboost” feature, which accessible for a precious eight seconds by shifting the SUV from drive to sport. 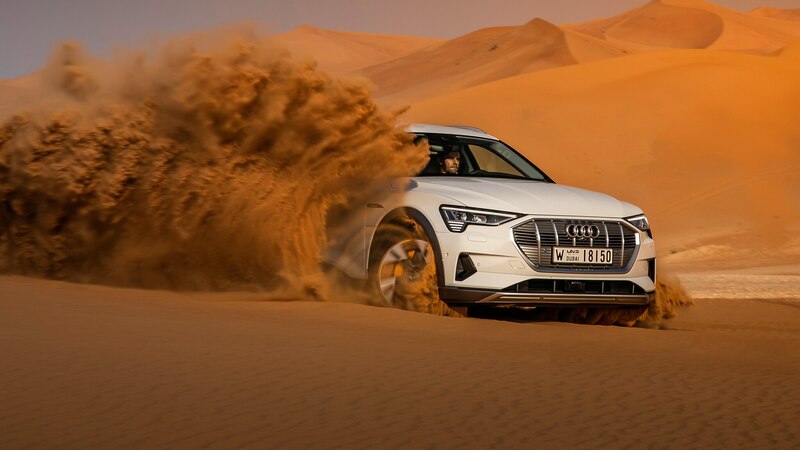 This is enough to drop the claimed zero-to-60-mph sprint to 5.5 seconds, albeit while leaving the vehicle’s top of speed of 124 mph unaffected. 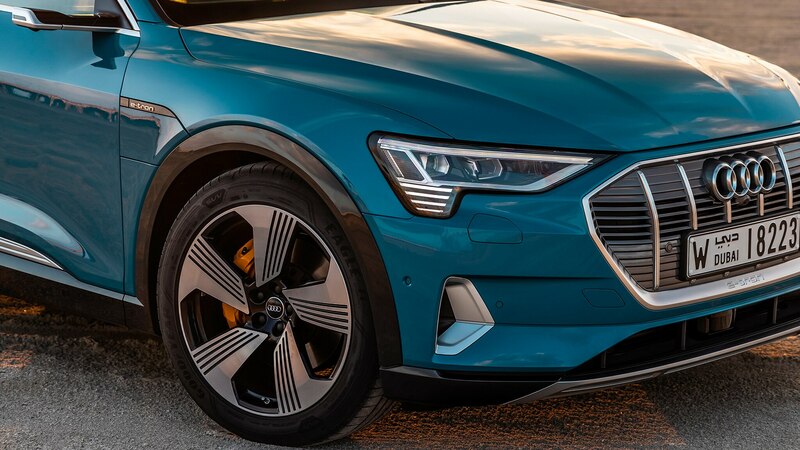 Should you grow tired of accelerative shenanigans and seek instead a more practical application of the e-tron’s torque, Audi states a 4,000-pound tow rating. 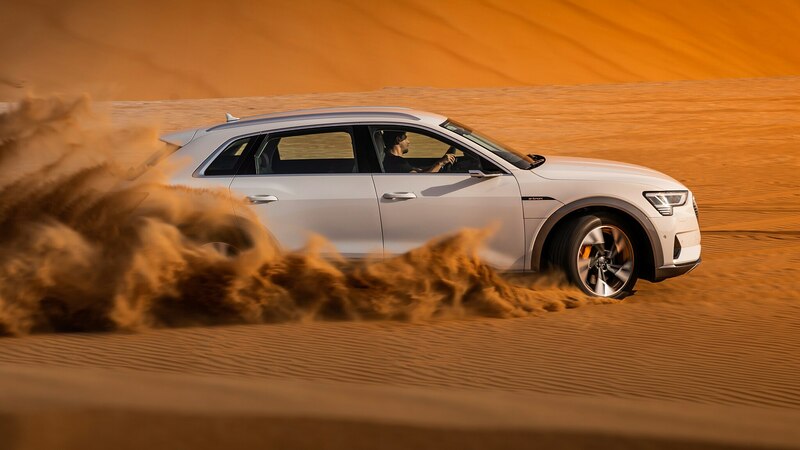 Abu Dhabi’s generous highway speed limits of up to 100 mph provide ample opportunity to test both drive modes. 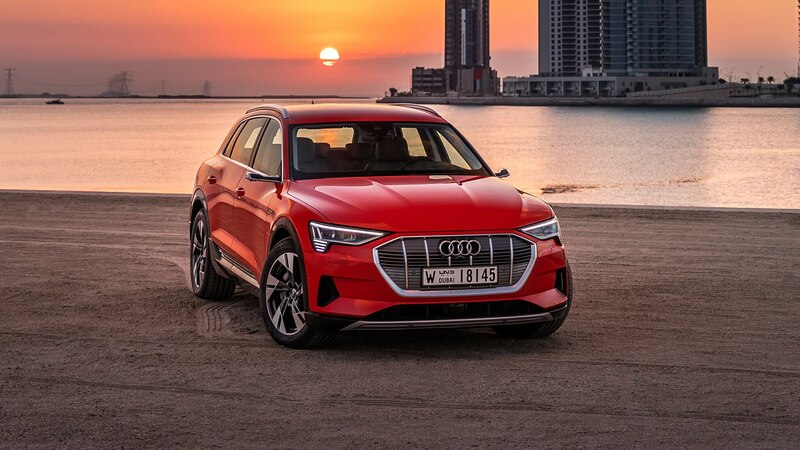 It is currently the Year of Zayed, celebrating the centenary of the UAE founder’s birth, and we have arrived just a few days after the National Day celebration, which has the entire city bathed in bright colors. 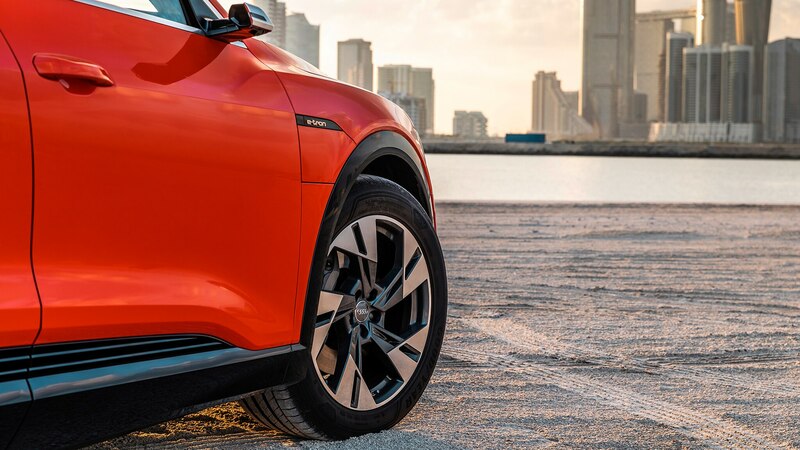 The city is also run amok with full-size SUVs, their tailgates temporarily plastered with celebratory full-color vinyl wraps of the Sheikh’s smiling face. 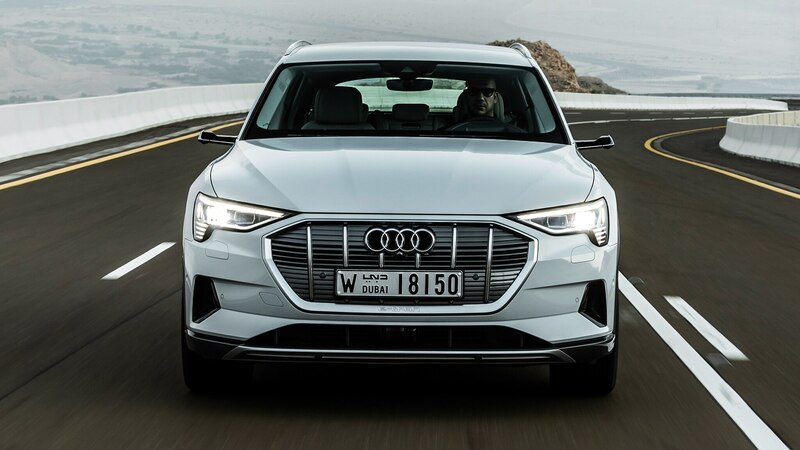 We repeatedly surge and slow our way through this traffic, impressed by how quickly the e-tron achieves triple-digit speeds. 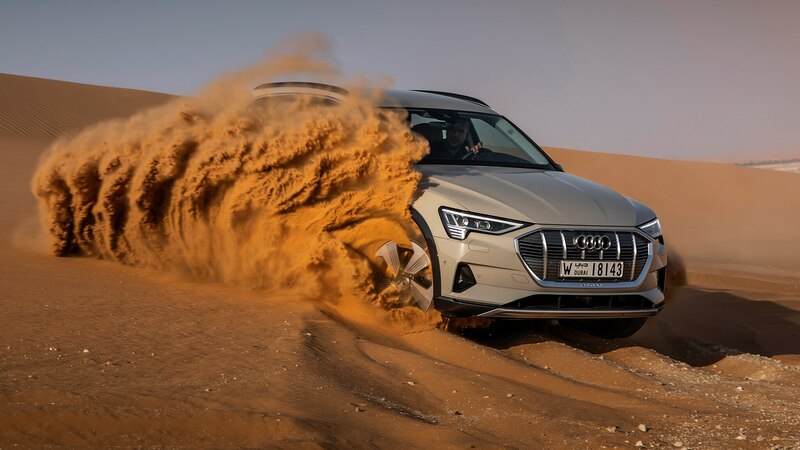 While there may be a slight edge in initial take-off in the overboost mode, the crossover scoots swiftly regardless of where the shifter sits. 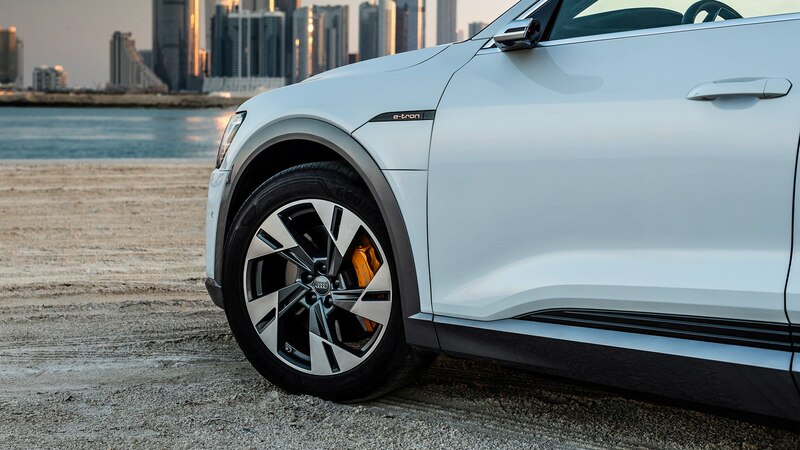 The SUV’s air springs can lower the ride height as much as an inch for improved handling at speed, as well as raise the vehicle by 1.4 inches for extra ground clearance. 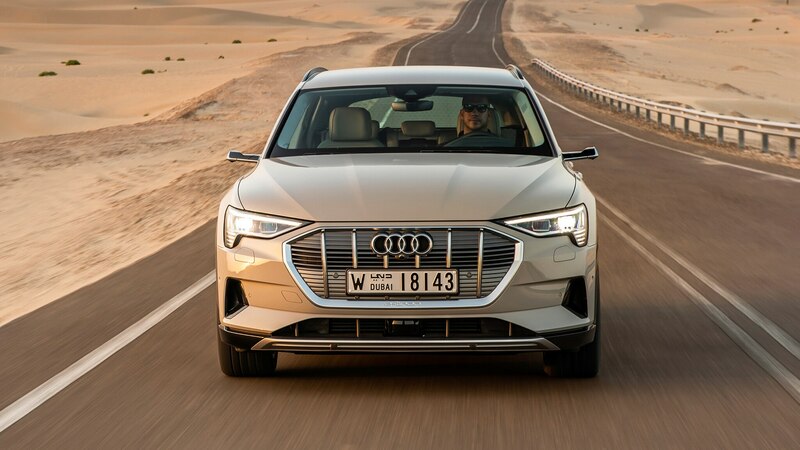 Surprisingly smooth-riding while cruising even on its 20-inch wheels, the e-tron also feels planted—if just shy of fun—when tackling the spectacular four-lane sinew of Jebel Hafeet Mountain Road. 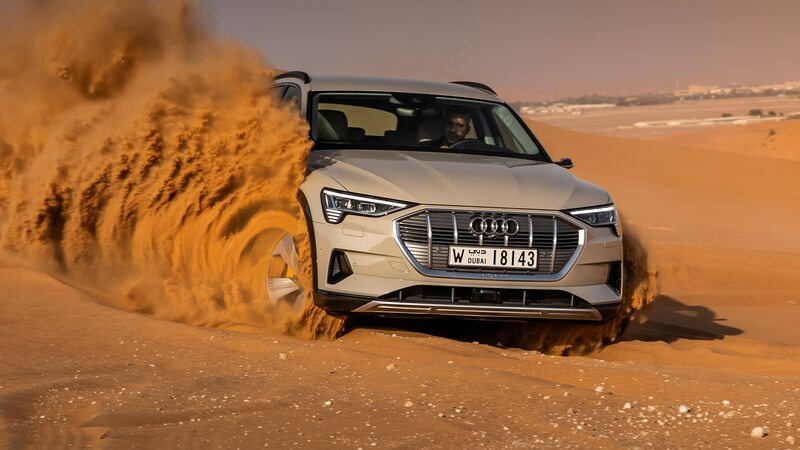 These seven miles of switchbacks lead us some 2,000 feet up from the desert floor, and once at the peak, both vehicle and passengers enjoy an expansive view across the border into Oman, an invisible line in the sand that bisects not just Jebel Hafeet but also the Al Hajar Mountains. 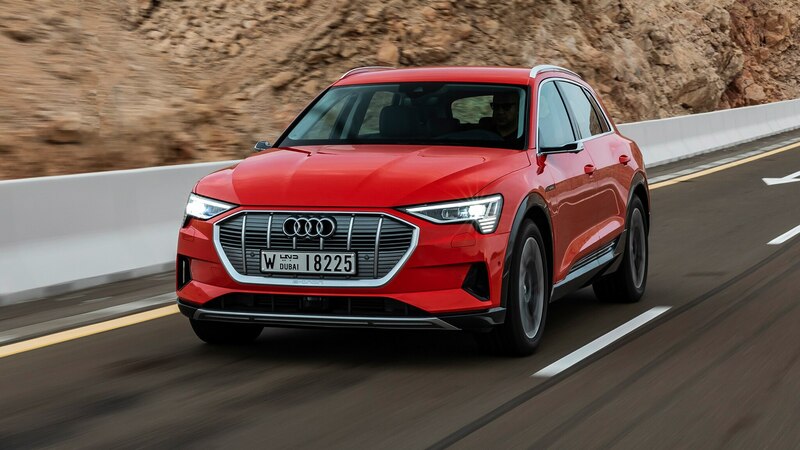 Prior to making the descent, the e-tron’s development team pair each SUV with a tablet app that offers in-depth analysis of the charging system’s regenerative braking feature, showing how much energy is being captured under deceleration. 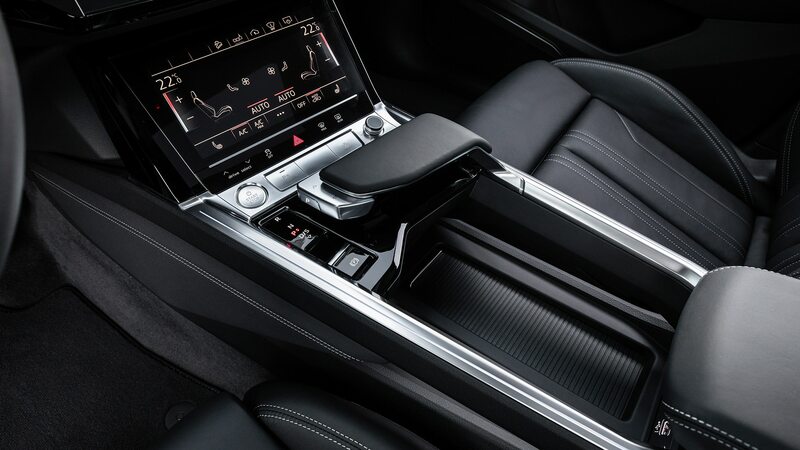 Slowing can be accomplished using the brake pedal, of course, but also via paddles attached to the steering wheel. 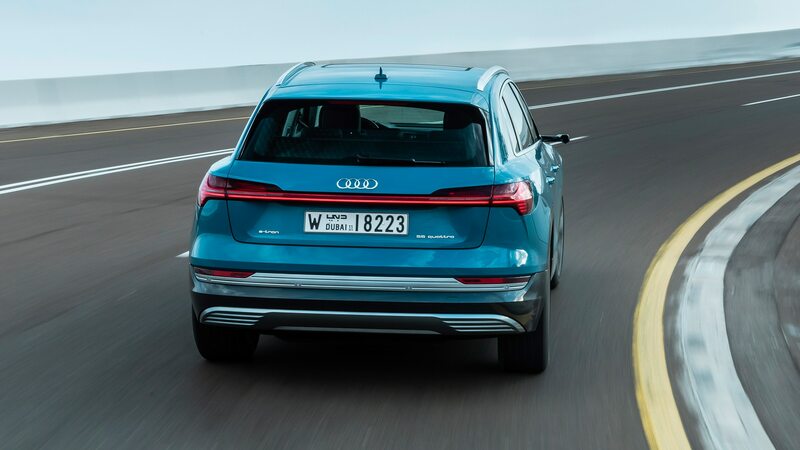 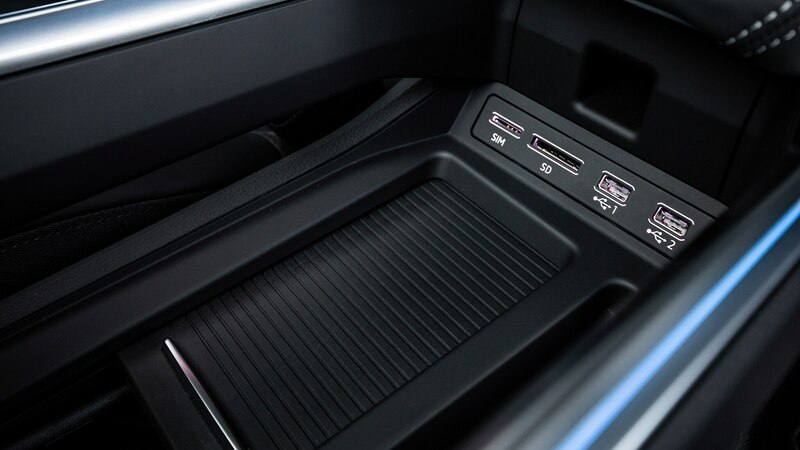 The three-stage paddle-operated system is fairly intuitive, and thus Audi, adamant that that most crossover shoppers aren’t interested in ‘one-pedal’ EV driving, have kept its electrohydraulic and regenerative braking systems fully separated from a feedback perspective. 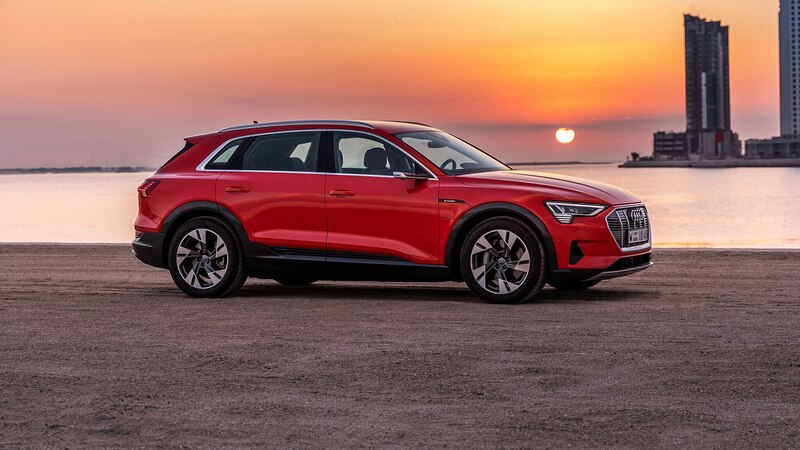 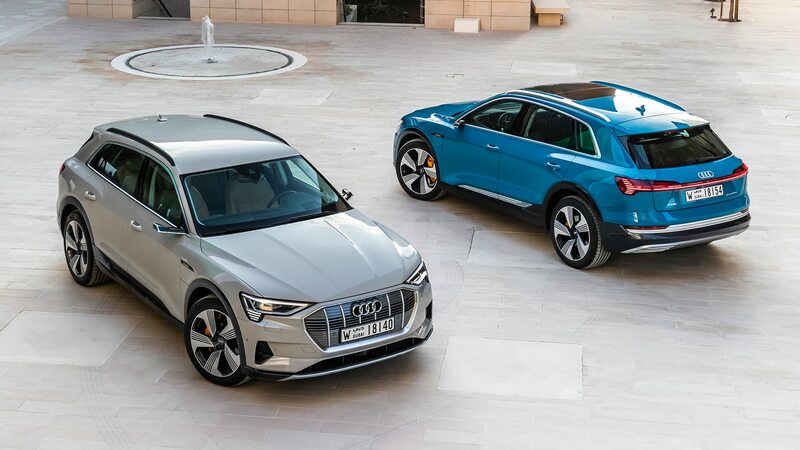 The brand’s unwillingness to re-educate the right feet of potential customers is a telling indication that the e-tron is aimed at the mass market rather than the small cadre of existing EV enthusiasts. 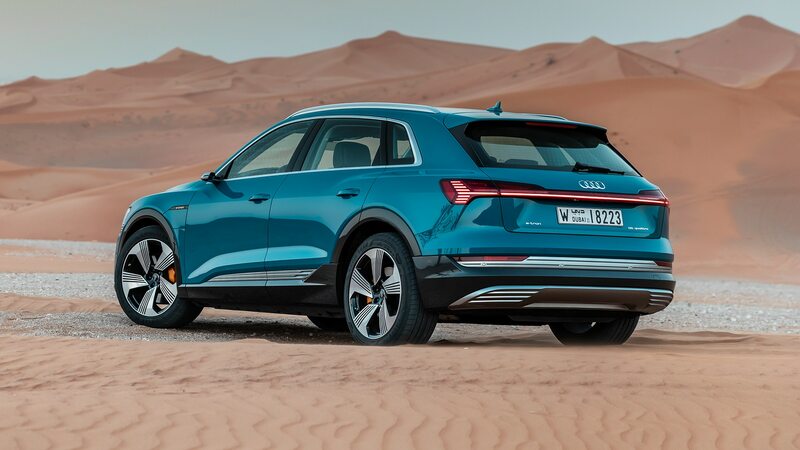 How far you’ll be able to travel while enjoying one of the SUV’s two well-equipped trims (Premium Plus starts at $74,800, while the Prestige is $81,800) is still a bit of a mystery. 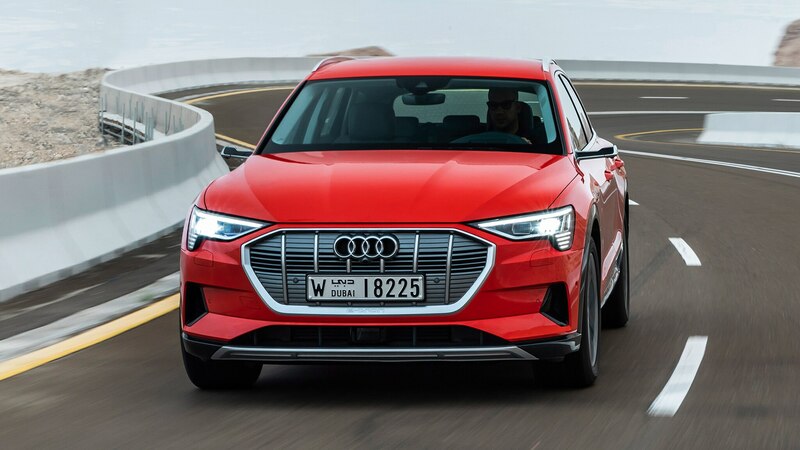 Audi is still waiting for EPA certification—that will necessarily come before the vehicle goes on sale in the U.S. in the spring of 2019—but we saw roughly 200 miles per charge during our day with the vehicle. 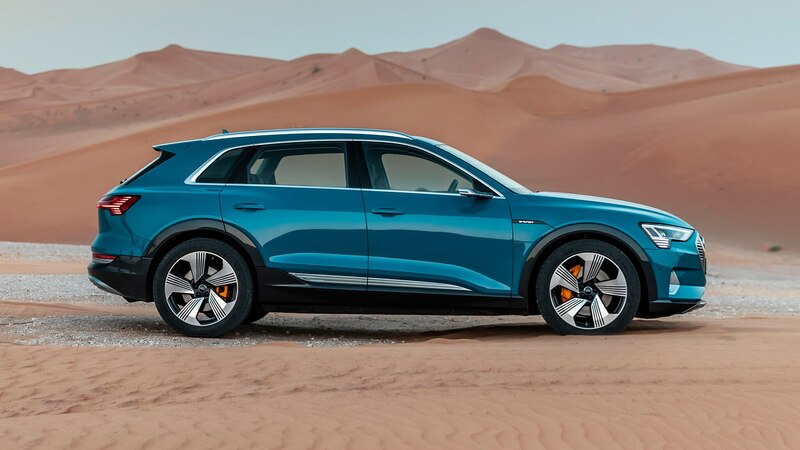 For those keeping score at home, Jaguar’s I-Pace will do 234 miles per charge, while base models of the three-row Model X are good for 237 miles. 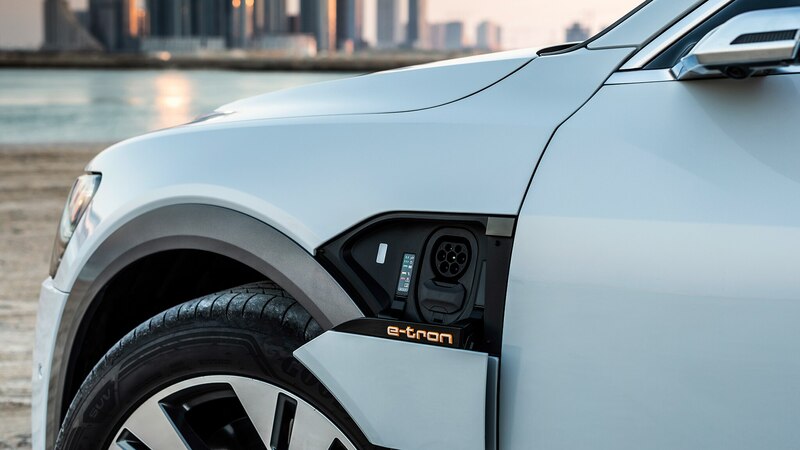 Charge times for the e-tron start at 30 minutes to achieve 80 percent full when using a 150-kW fast charger, down to an eight-hour top-up using a high-voltage home power source and the vehicle’s built-in 9.6-kW charger. 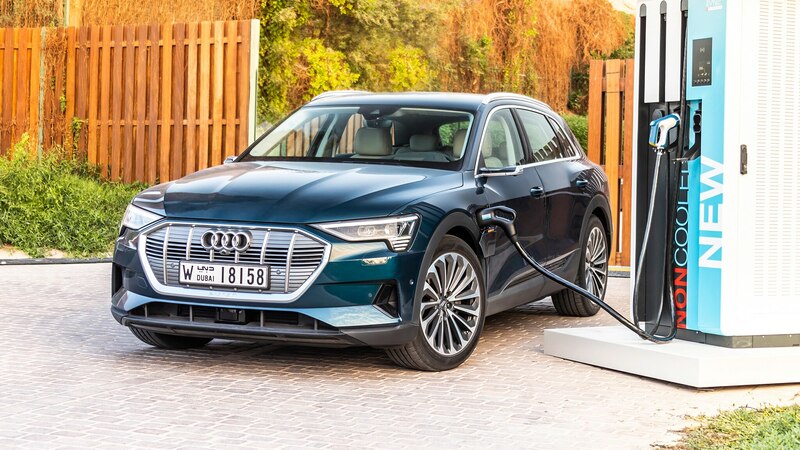 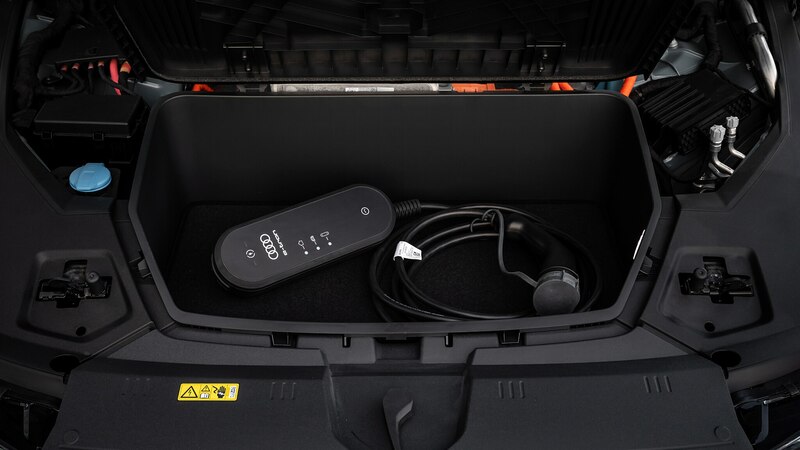 In alliterative fashion, Audi has partnered with Amazon as its installer of home charging stations, while also offering 1,000 kWh of free charging for roaming owners via the Electrify America network. 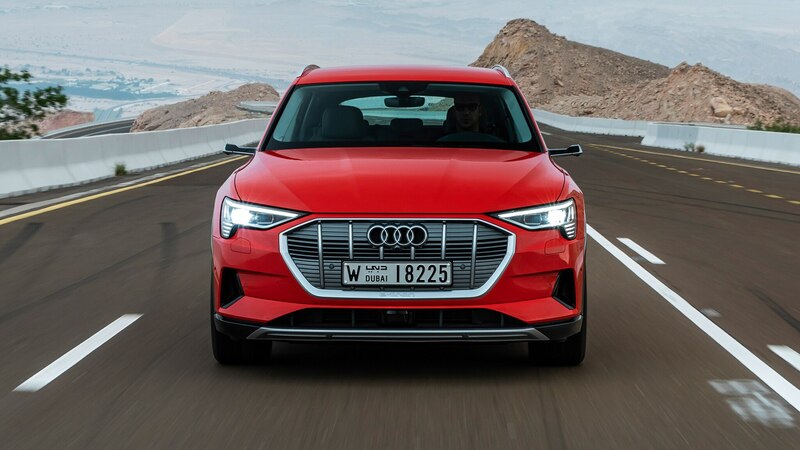 There are few, if any, major flaws to discover when dissecting Audi’s initial foray into its brave, new EV future. 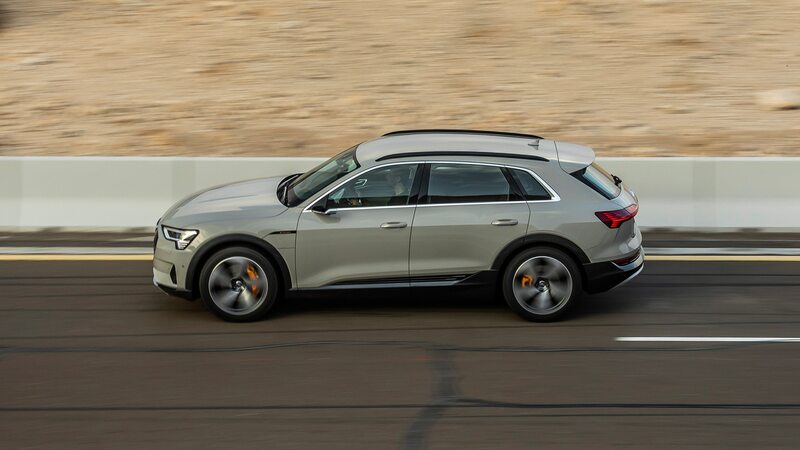 In a perfect world, would we want closer to 300 miles of range available from the e-tron, as found with top-tier versions of the Model X? 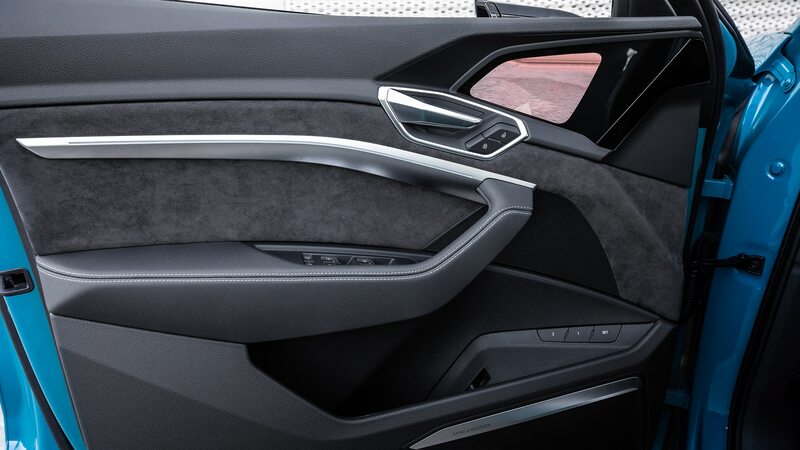 Certainly. 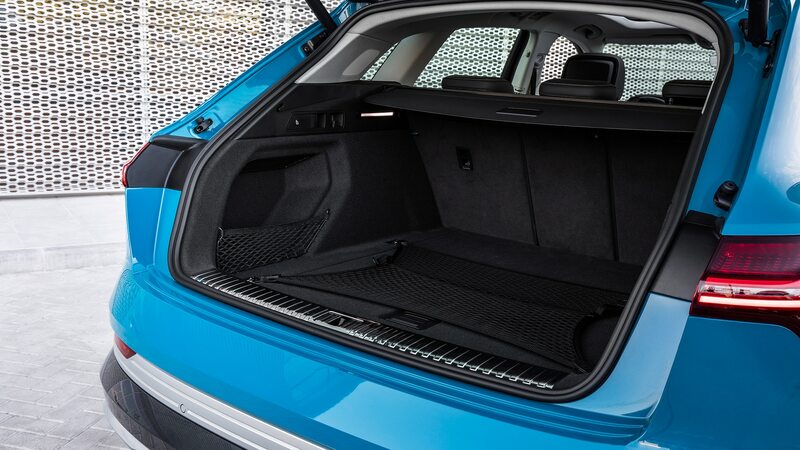 Would we trade that extra capacity for the fit and finish, handsome design, and dealership experience that come with an Audi? 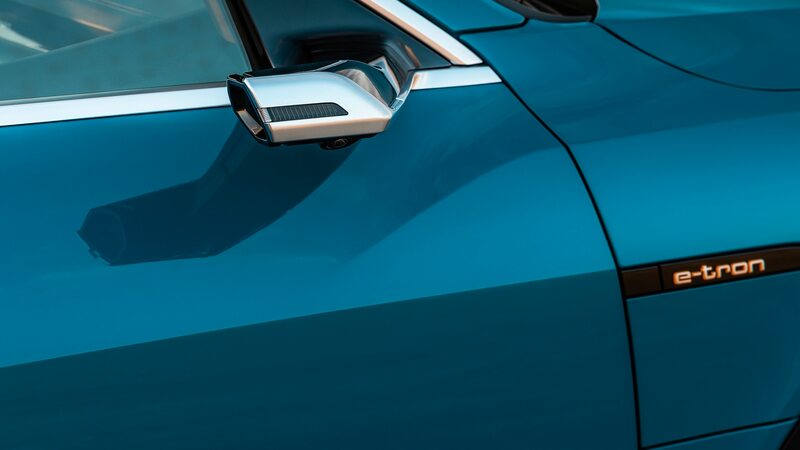 Same answer. 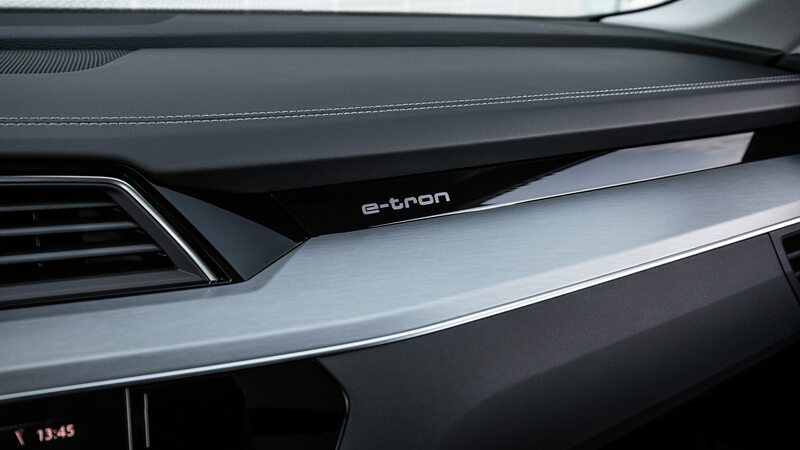 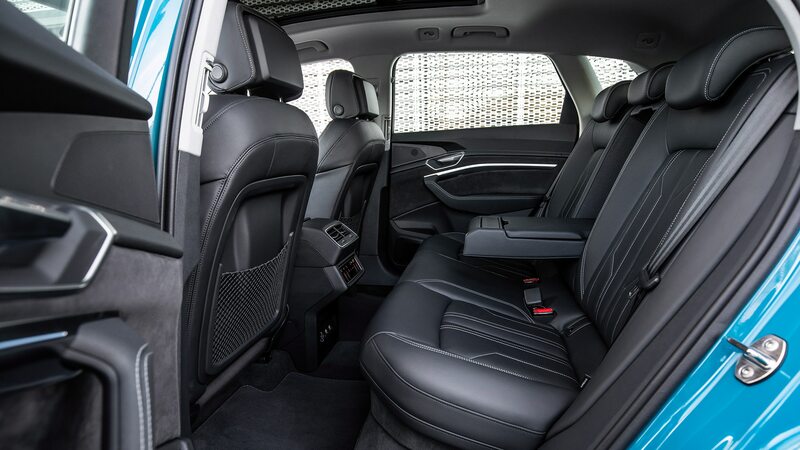 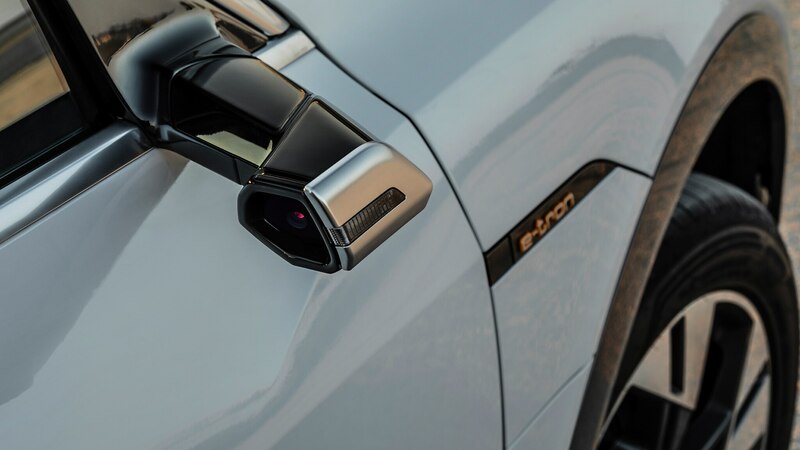 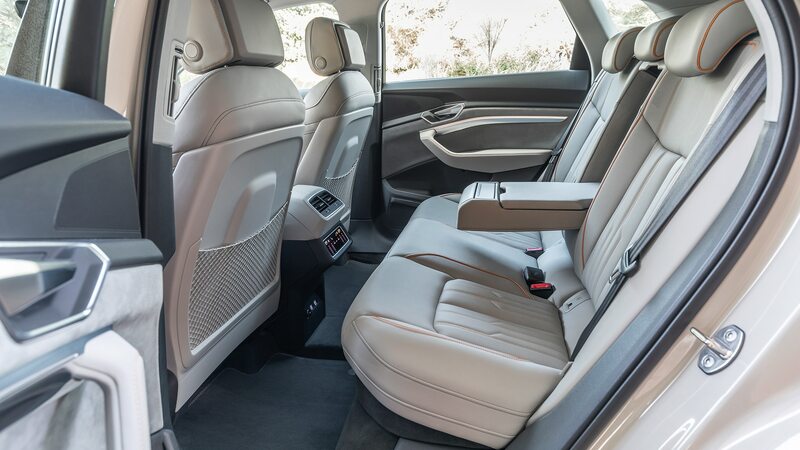 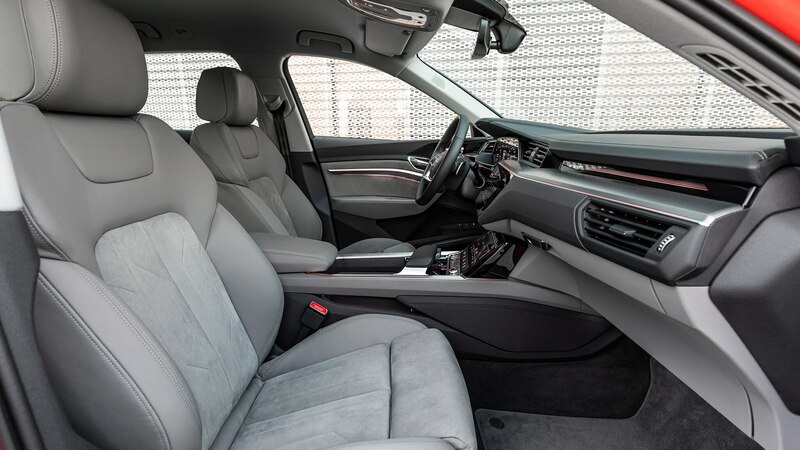 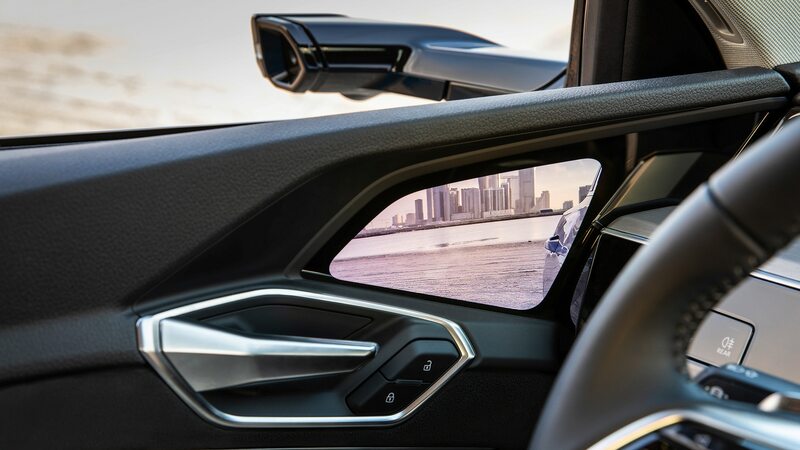 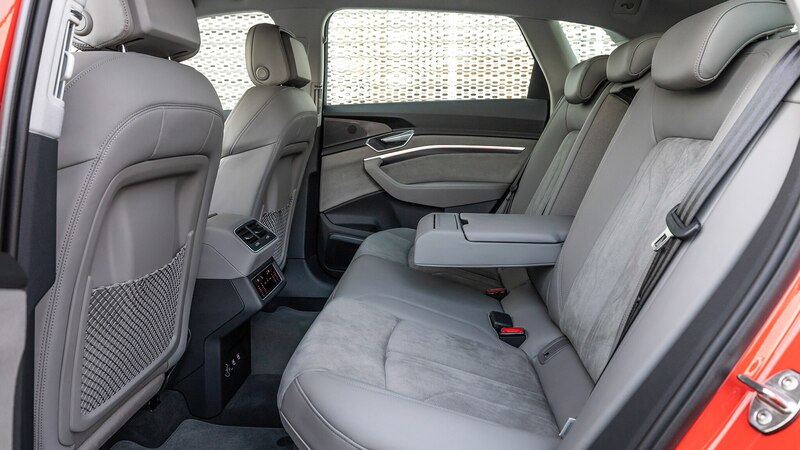 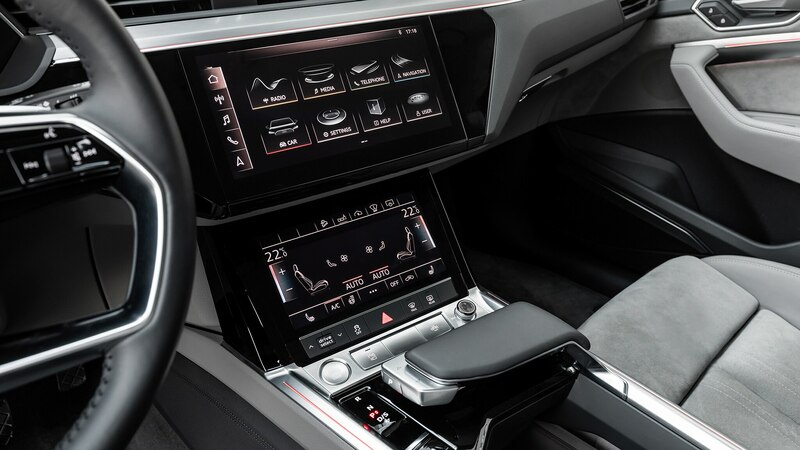 The e-tron’s remarkably quiet, touchscreen-lined cabin is filled with leather, wood, and soft plastics, but the not-for-the-U.S. video camera side “mirrors” drag down the overall experience. 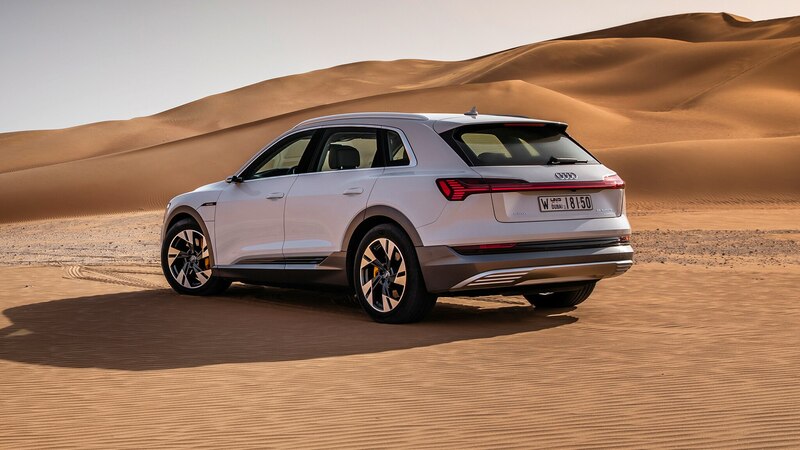 Their views are too easily washed out by bright sun by day and blurred by headlights at night, and they feel like a technological answer to a question that was only being asked by aero engineers seeking to scrub yet another decimal place from the SUV’s drag coefficient. 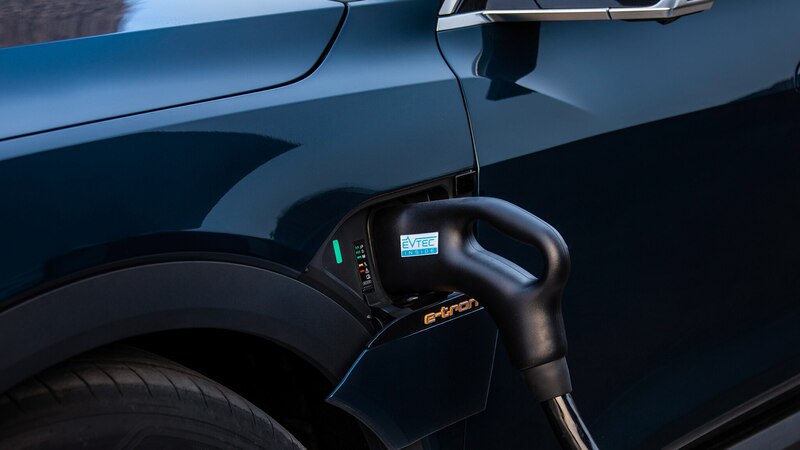 Aside from this not poorly executed party trick, however, the e-tron in many ways heralds the end of the beginning for mainstream electric cars in America. 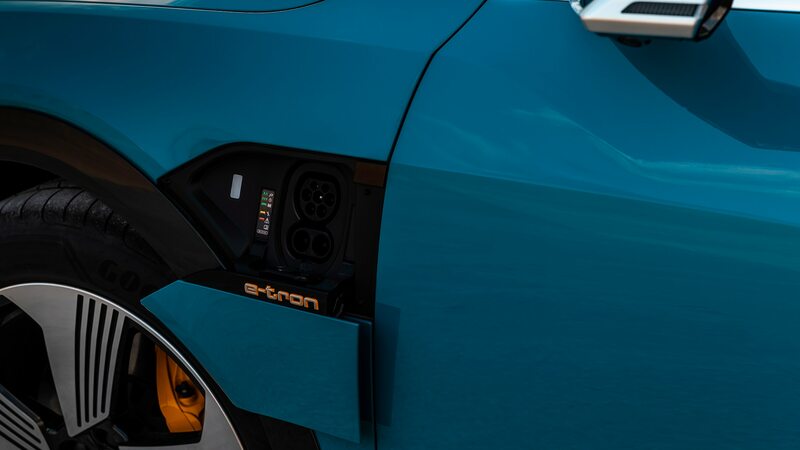 This is no compliance one-off, science experiment, or venture-capital-funded vaporware. 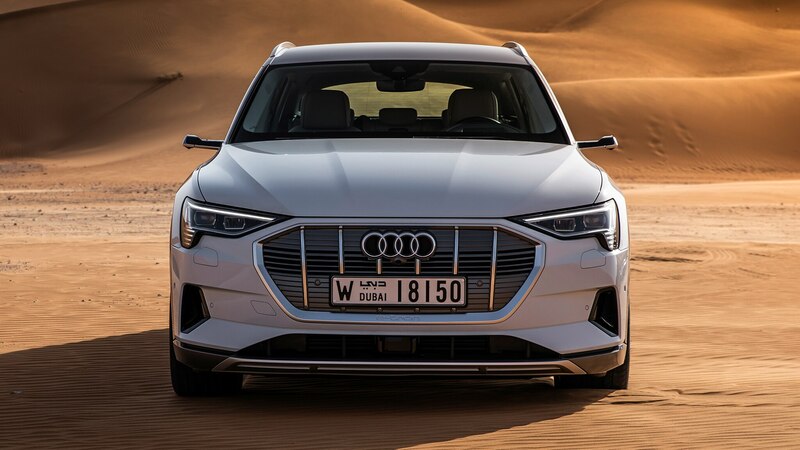 Like Sheikh Zayed, the man who set the Emirates on a sustainable economic path parallel to its petroleum prosperity, Audi knows that the clock is ticking on internal combustion, and the VW Group in fact just announced that its next-generation gasoline engines will be its last. 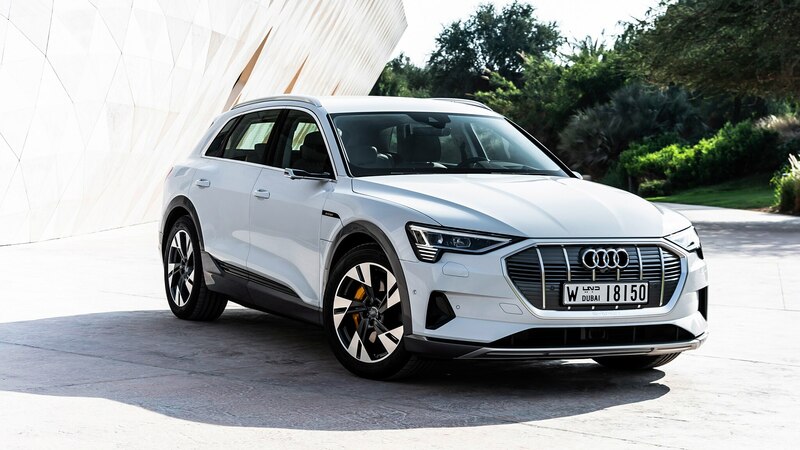 Alongside its Jaguar and Tesla peers, the e-tron and its soon-to-follow siblings prove just how serious major brands have become about providing legitimate alternatives to the global oil addiction.